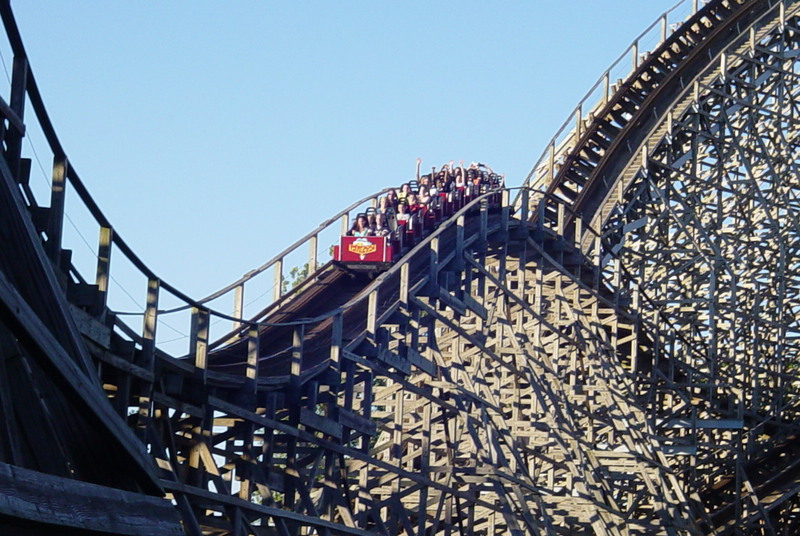 Cedar point has had a long history dating back to its first rollercoaster called the Switchback Railway from LaMarcus Adna Thompson back in 1892. It stood 25 feet tall and had an estimated top speed of about 10 mph, it also was one of the first rollercoasters ever created. 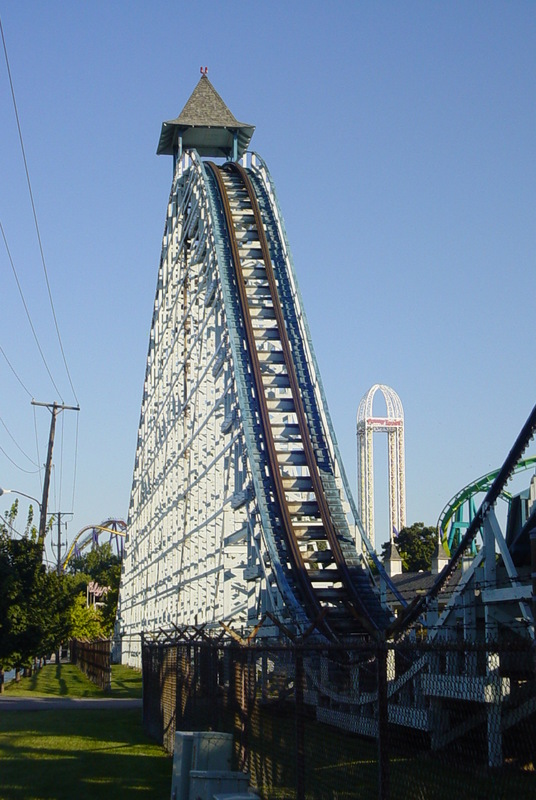 Cedar Points’ second rollercoasters was built in 1902 called the Figure Eight Roller Toboggan, that coaster was moved several years later and renamed The Racer. 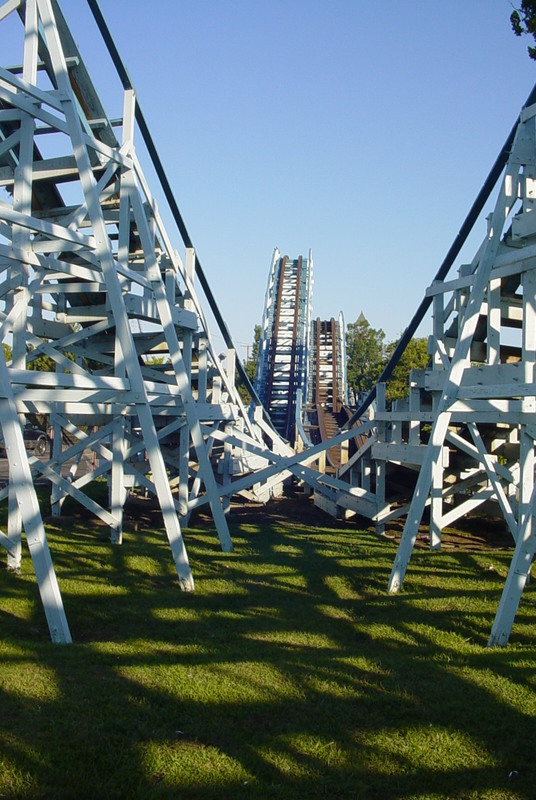 The early part of the 20th Century saw a flurry of coaster building with the Dip the Dips Scenic Railway in 1908, then the larger Leap the Dips in 1912 which was razed in 1917 in favor of the Leap Frog Scenic Railway which was then renovated in 1933 and renamed the High Frolics coaster. 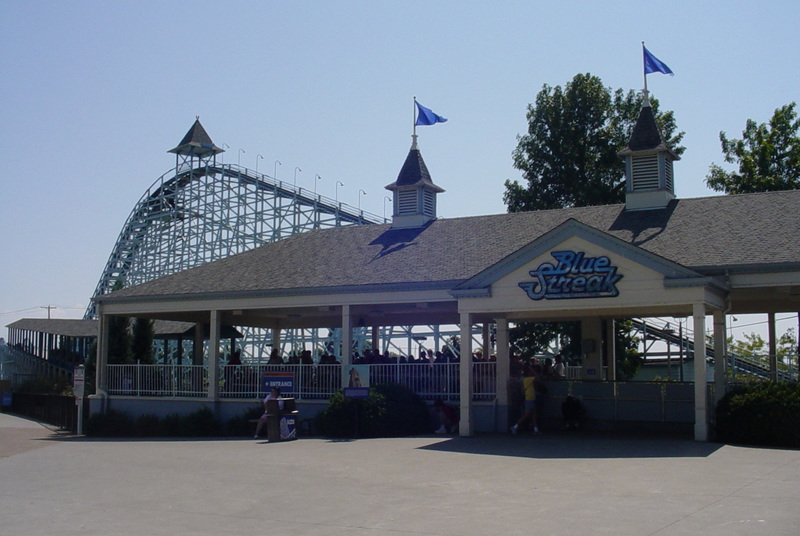 Then, in 1929, the Cyclone opened and that would be the last rollercoaster to be added until the 60’s with the addition of the Blue Streak wooden rollercoaster. 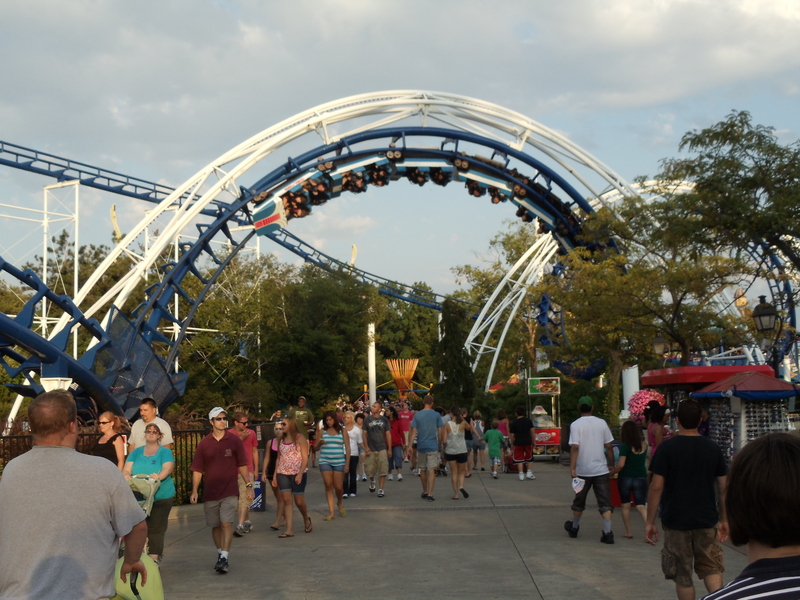 Now that you’ve received a brief history on the roller coasters, lets enter the park. This photo was taken back in 2010 and boy has it changed since then. There’s a new gate with Cedar Points’ newest rollercoaster going through two “keyholes” on top of the main entrance. 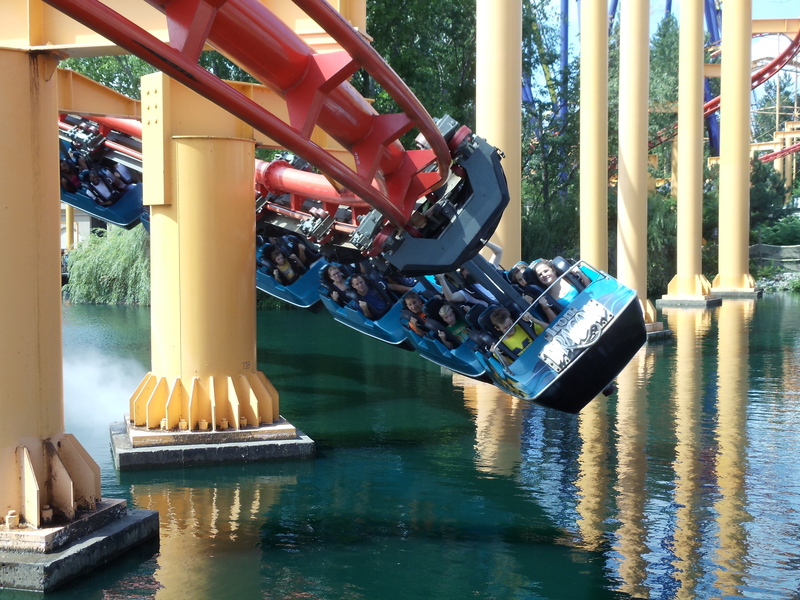 The new coaster (built after my last visit there) is a Winged Coaster from B&M called Gatekeeper. Now that we’re through the gates, we are going to walk down past the Skyride, turn left and go under Raptor and head to our first rollercoaster. 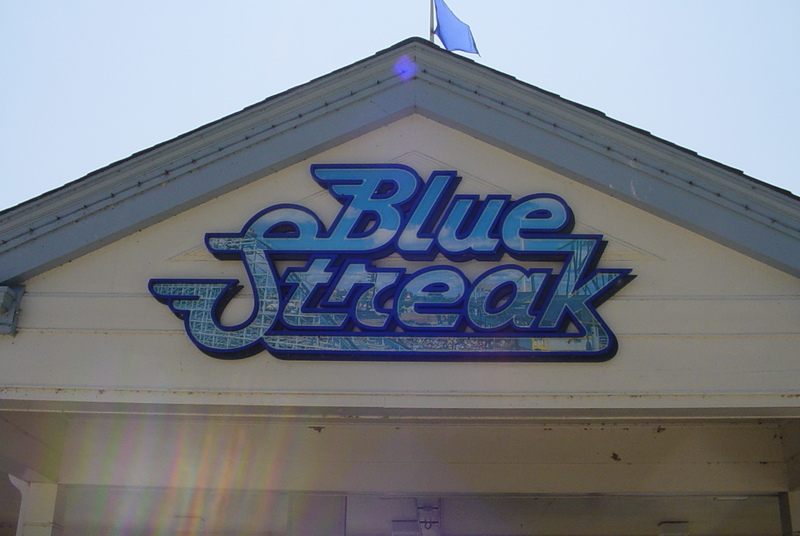 Blue Streak was Cedar Points’ first wooden rollercoaster since the Cyclone was demolished in the 1930’s and it was their second roller coaster after the addition of the Wild Mouse in the mid 50’s. 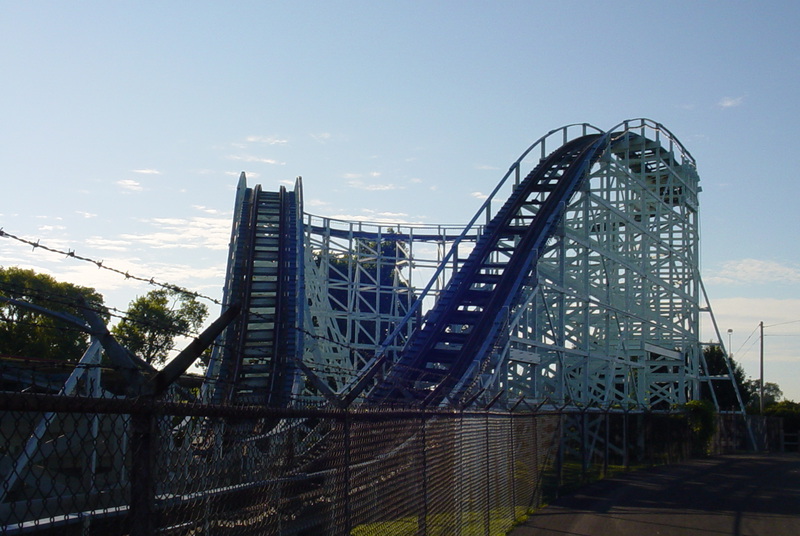 It was built by the Philadelphia Toboggan & Coasters (PTC) company in 1964 an It was designed by John Allen. 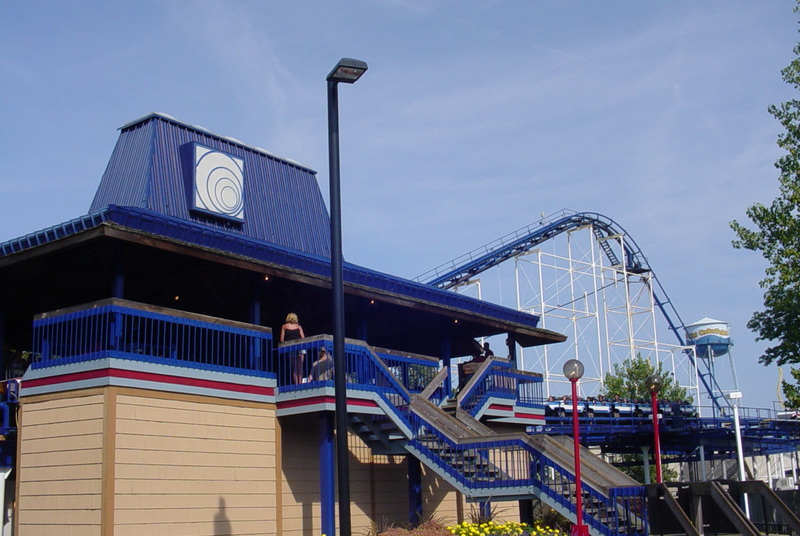 Blue Streak is Cedar Points’ oldest operating rollercoaster and it still provides a great ride despite being overshadowed by its much younger siblings in the park. This one is a “out-n-back” design which means it goes straight out to a point, then turns around, and comes back to the station. The ride itself is 2,558 feet long, stands 78 feet high, has a top speed of approximately 40 mph, and a ride time of about one minute and forty-five seconds. Next we’ll let our feet dangle on our next coaster. 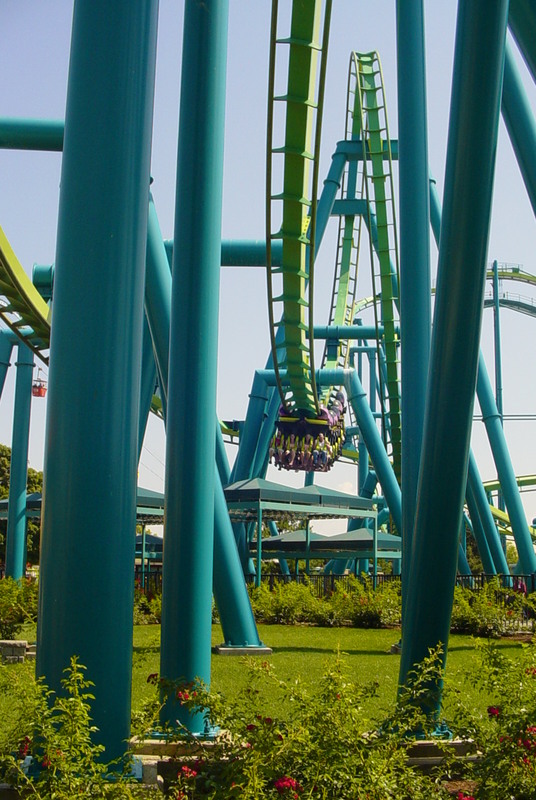 Raptor is an inverted roller coaster from Bollinger & Mabillard (B&M). 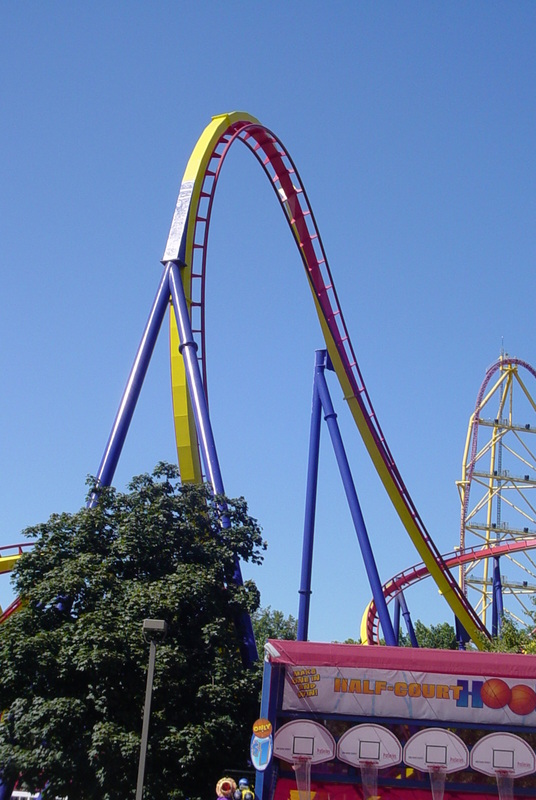 Believe it or not, there is a difference between Suspended and Inverted roller coasters. An inverted model does invert (go upside-down) and has trains that are fixed to the rolling stock (where the wheels are located). 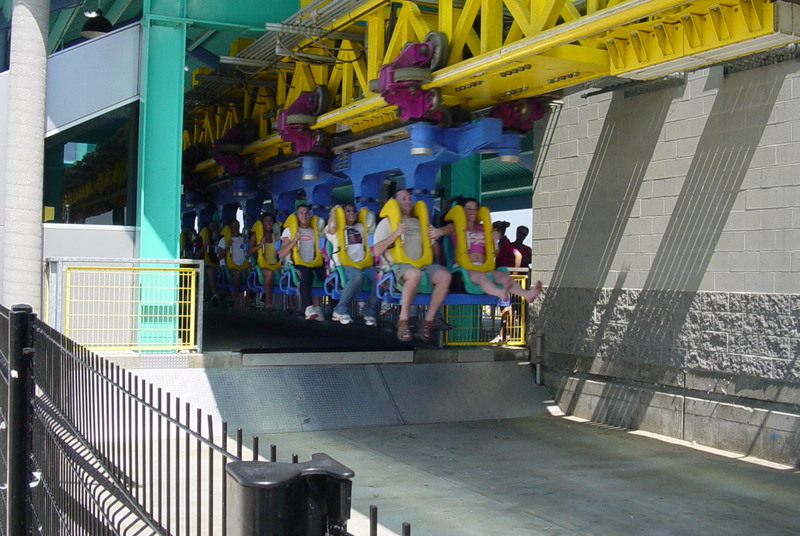 A Suspended coaster does not invert riders but does have trains that have cars that can swing independently from side to side. 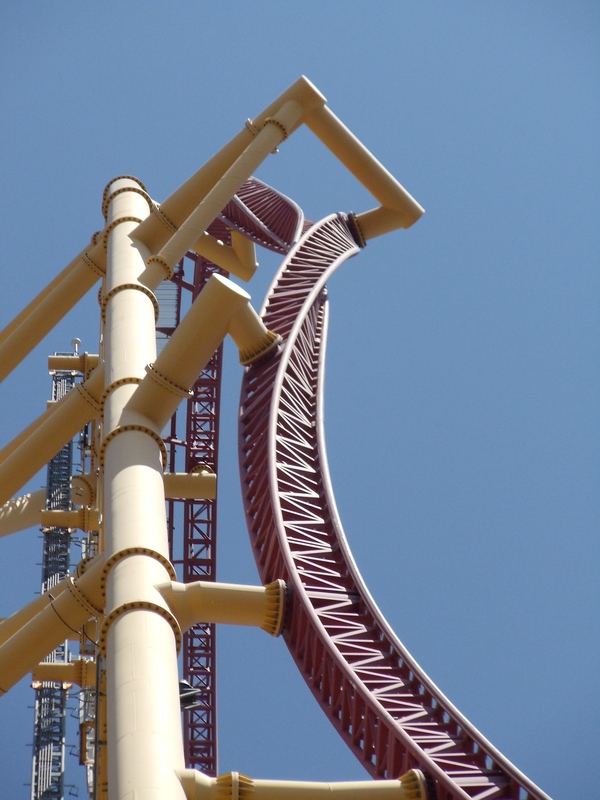 Look at the photos and video of the Iron Dragon roller coaster on this page for a visual example of what a Suspended coaster looks like. 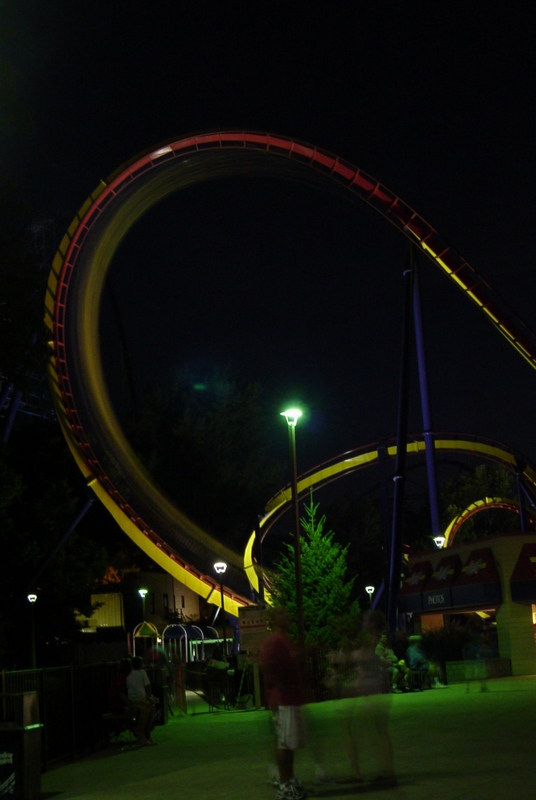 Raptor is an incredibly intense roller coaster and is one of the best Inverted coasters I’ve ever ridden. 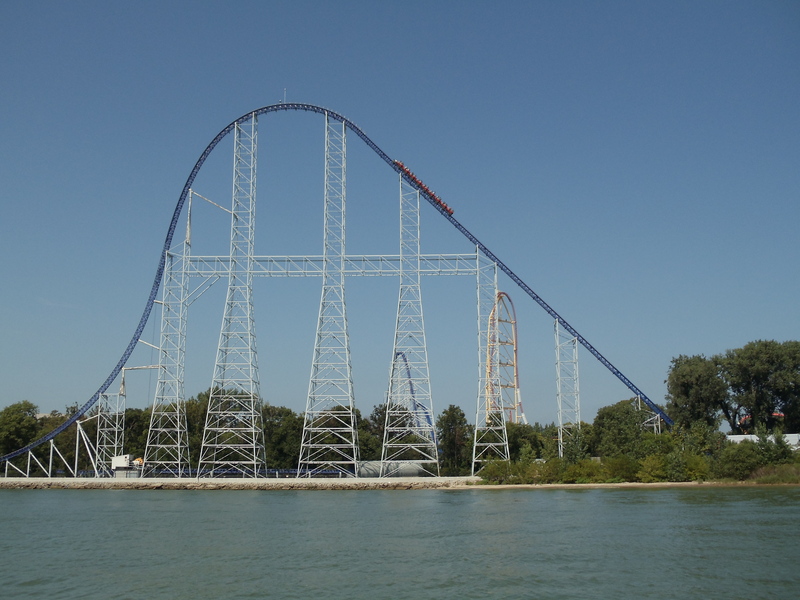 It opened to the public on May 7, 1994 and is 137 feet tall, has a drop of 119 feet, is 3,790 feet long, has a top speed of 57 mph, has six inversions, and a total ride time of about two minutes and fifteen seconds. Here are some spectacular night shots of the trains going through different inversion elements. Here’s a off ride video of Raptor. 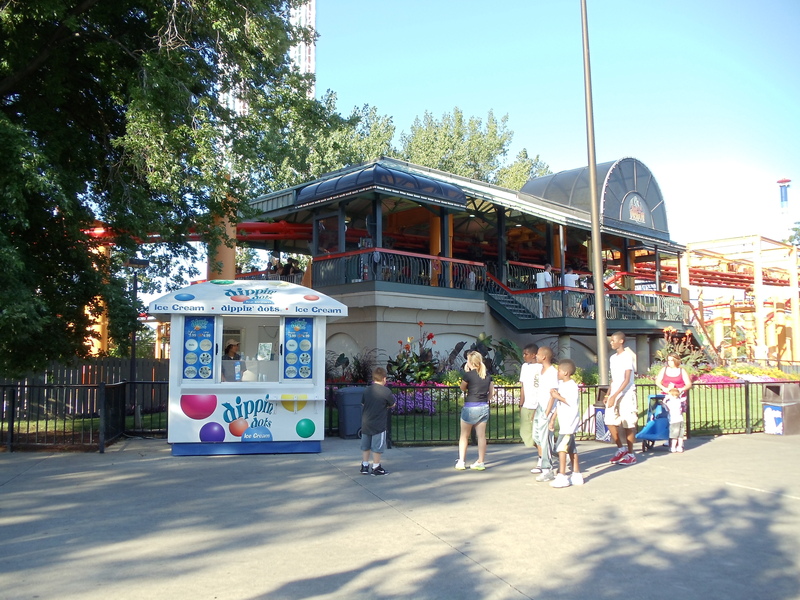 Next, we walk north, across the Million Dollar Midway, under the Skyride, pass maXair and the Giant Wheel to our next coaster. 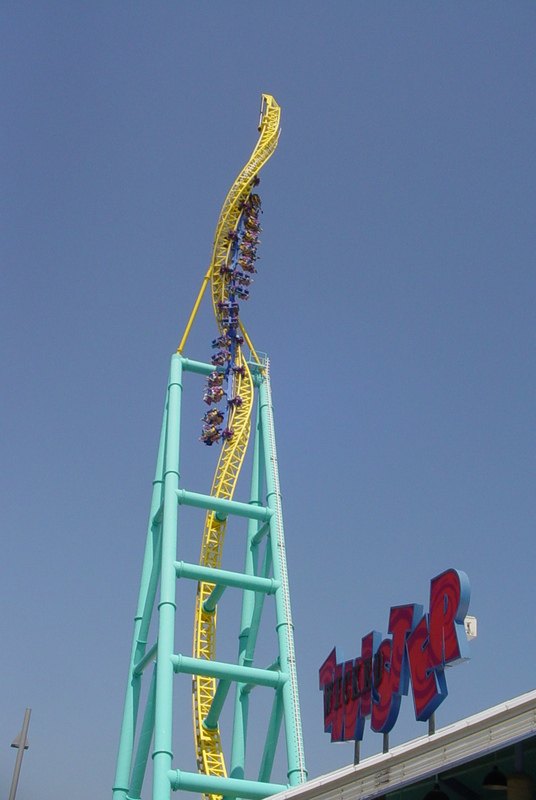 Like Raptor, Wicked Twister is also an inverted coaster but this one is a completely different design called a Shuttle coaster. 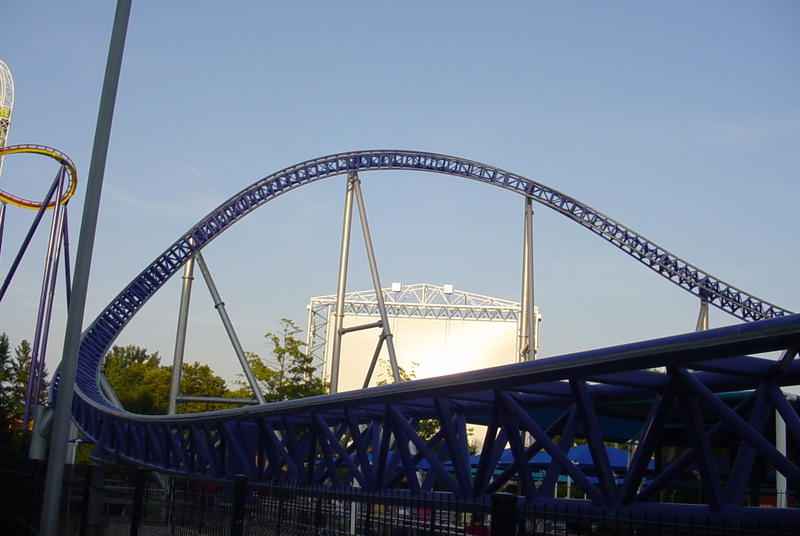 A Shuttle coaster is a roller coaster that has a track that doesn’t complete a full circuit like Raptor of Blue Streak does. 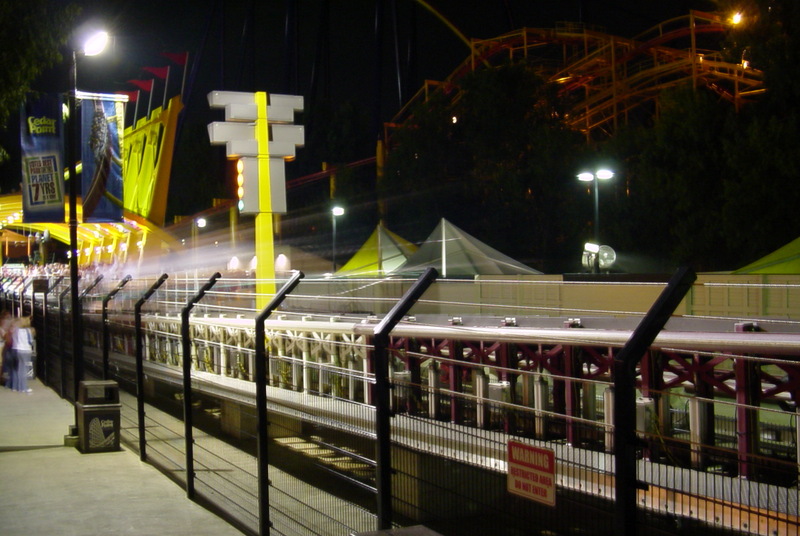 Shuttle coasters go out to the end of the track and then return back to the station on the same track it went out on. 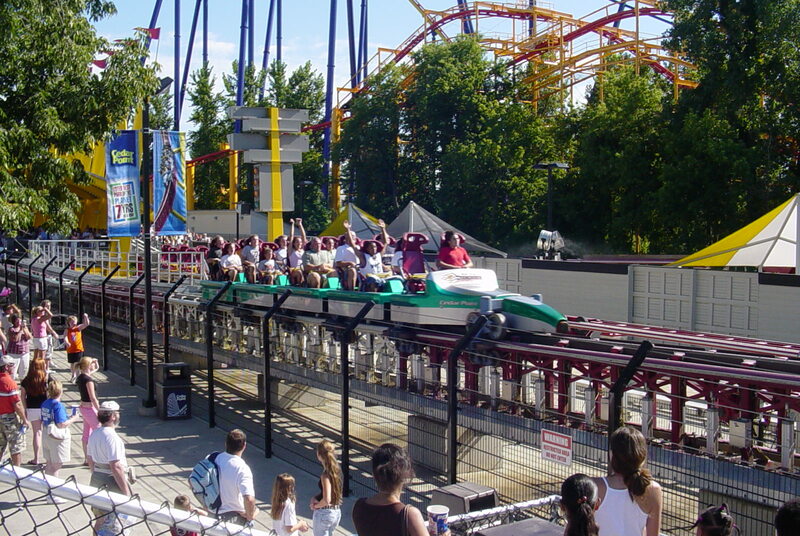 This coaster is launched out of the station into the front spike (in the background of the above photo), then the train comes back through the station and up the rear spike (in the foreground in the photo above). The train comes back through the station and gets a boost so it can travel almost to the top of the front spike, then the train rockets back through the station and up the rear spike and through the station for a fourth time where it travels up the front spike again. The brakes are smoothly applied after the train comes down and approaches the station for the passengers to disembark. 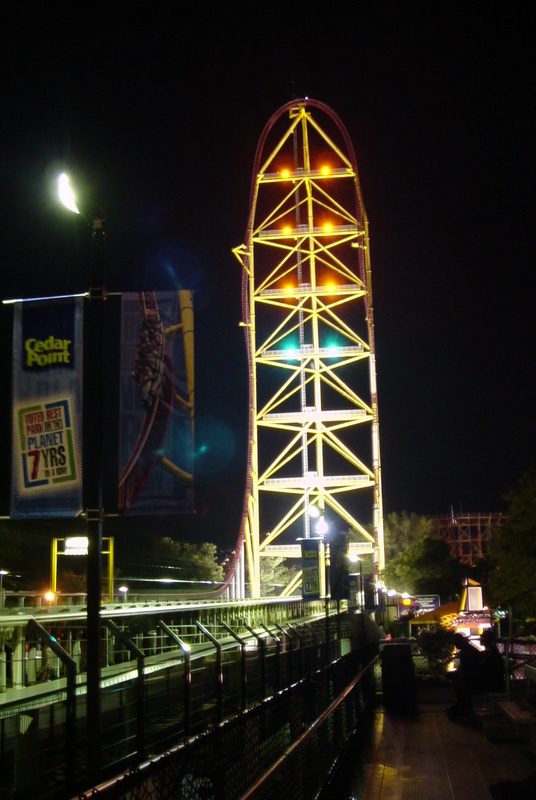 This coaster opened on May 5, 2002 as the worlds tallest and fastest shuttle coaster, it still holds that title too this day. 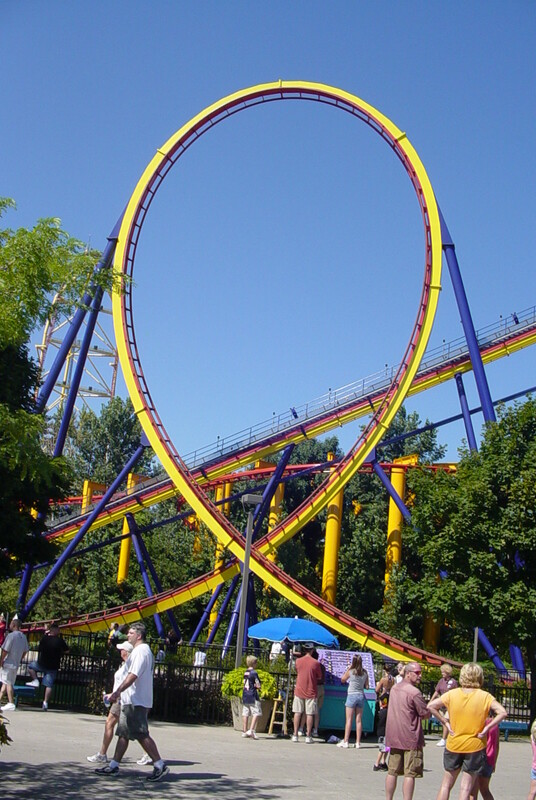 It was designed by Intamin AG, is 215 feet tall, and has a top speed of 72 mph. Now we’ll walk down the Million Dollar Midway, past the Coliseum and Skyride station and we’ve come to a fork in the road. 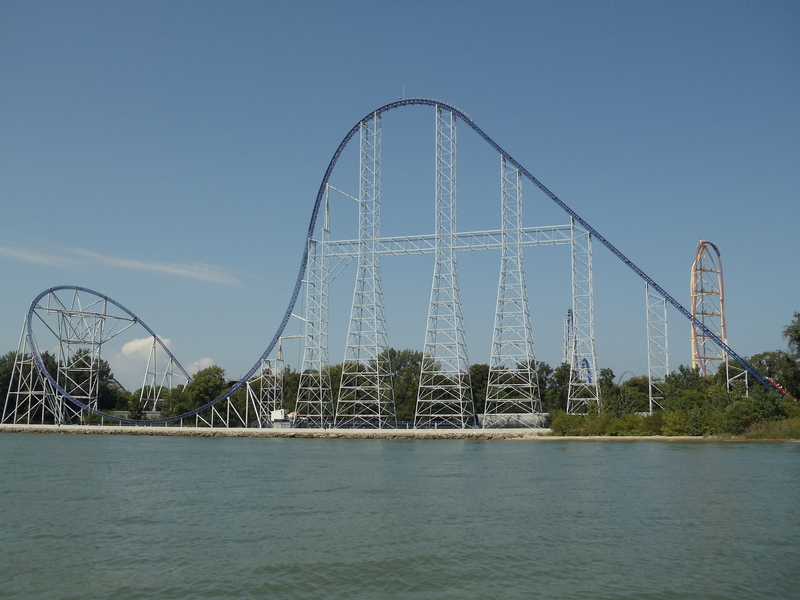 We can either turn right and go towards Magnum XL200, or we can turn left and go down towards Millennium Force. 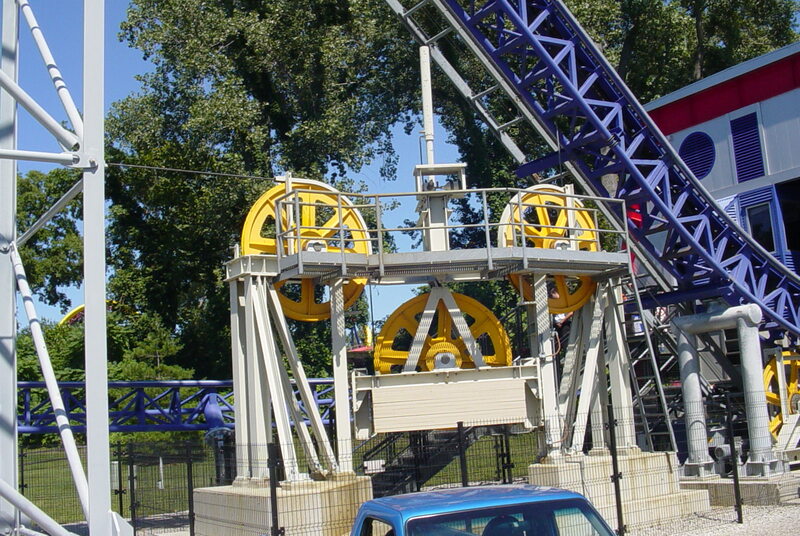 This time we will turn right and the first coaster we come to was a record breaker when it opened. 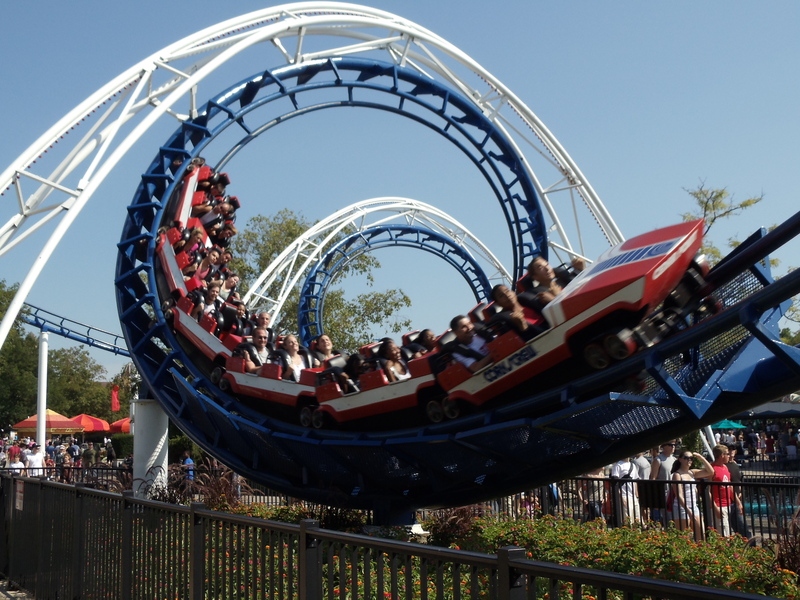 This was the worlds first roller coaster to invert riders three times with a loop and two corkscrews. 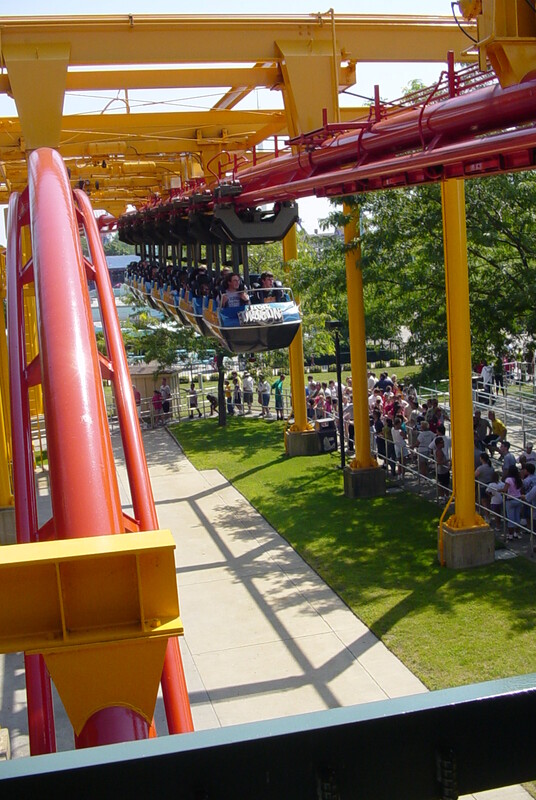 The two corkscrews actually go over the crowds below. 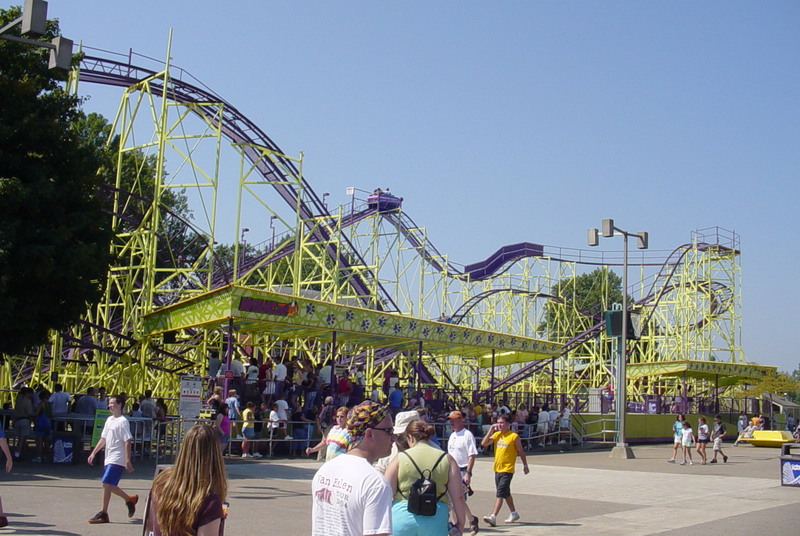 This coaster was built by Arrow Dynamics, designed by Ron Toomer, and opened here on May 15, 1976. 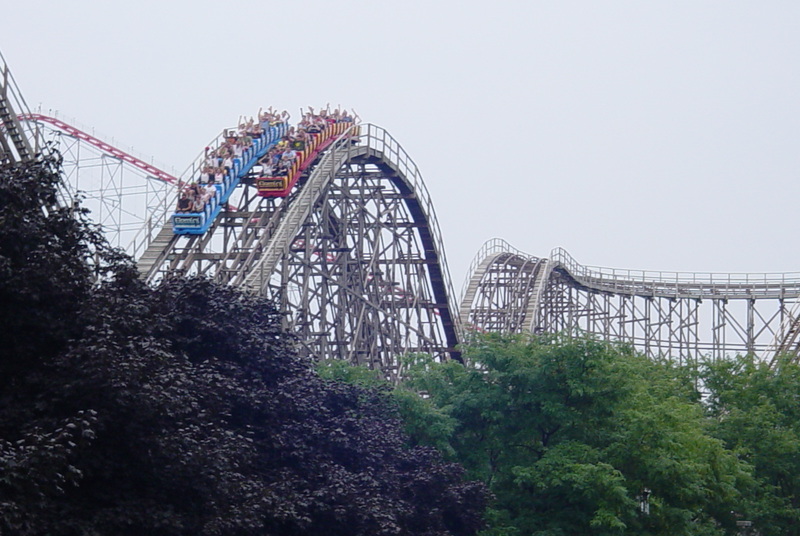 You’ll see that all three trains in the photos above are colored red, white , and blue as this coaster opened during the Bicentennial year of the United States of America. 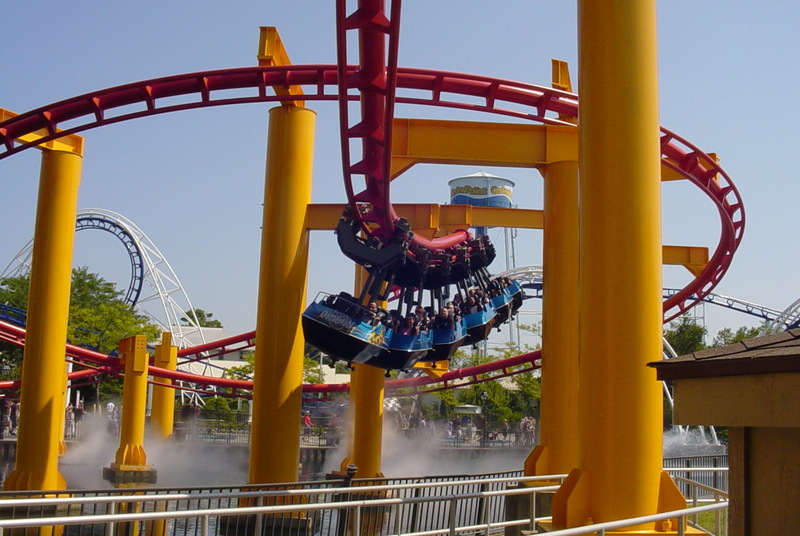 The Corkscrew is 2,050 feet long, is 85 feet high, and has a top speed of about 48 mph. 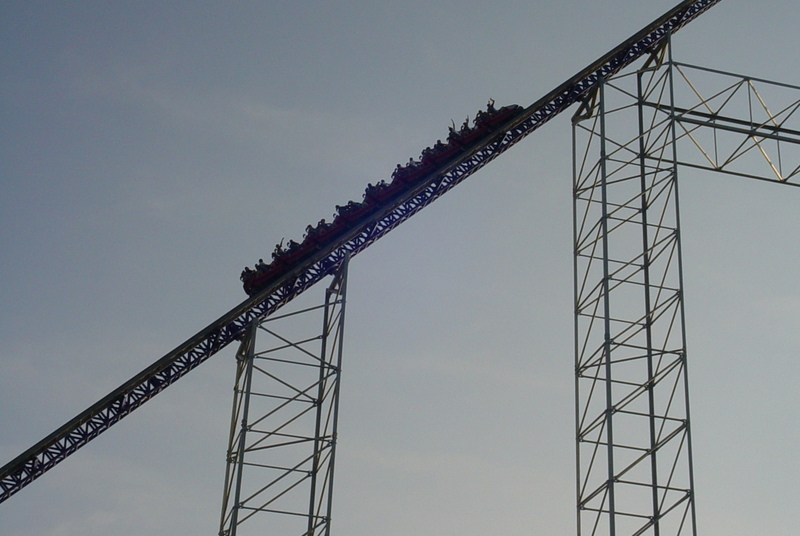 Next up is another record breaker when it opened. 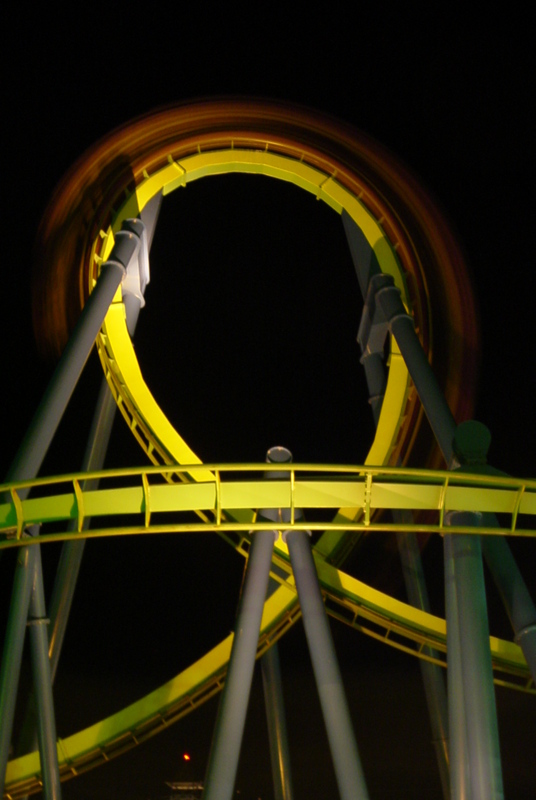 This coaster is definitely not for the faint of heart. It was the worlds’ first Stratacoaster, a designation given to any roller coaster that has a hill or drop exceeding 400 feet in height. 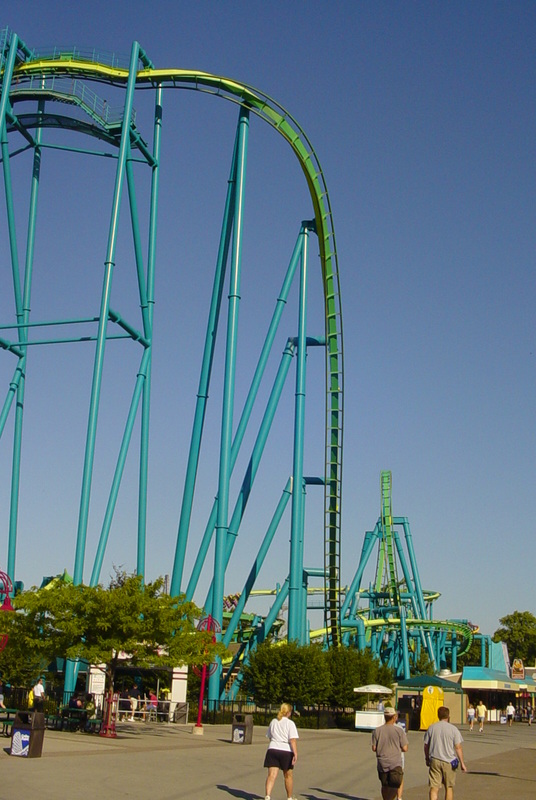 This monster of a coaster was designed and built by Intamin AG and it opened on May 4, 2003 as the worlds’ tallest at 420 feet, and the worlds’ fastest at 120 mph roller coaster. 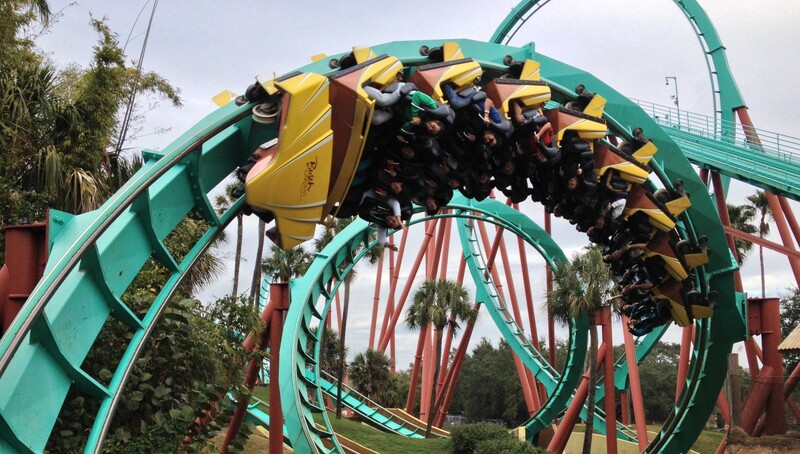 This coaster is also a launch coaster that rockets riders from zero to 120 mph in just over three seconds. 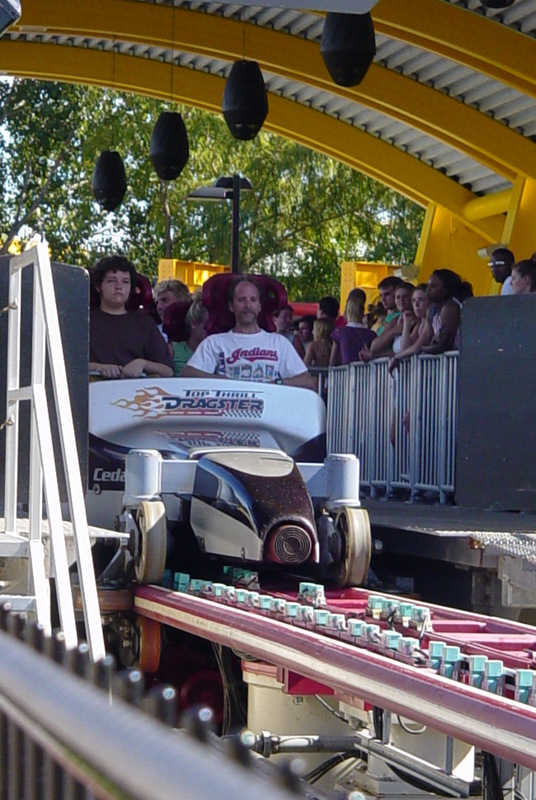 Riders board the Dragster themed trains and are secured using a three-point seat belt harness and a lap bar that locks you into your seat. The train is then moved into the launch position right next to the “Christmas Tree” light stand. The Christmas Tree is something you see at drag racing events, it’s the stand of lights that sits between the two drag racers as they wait for the green light at the start line. As you approach the Christmas Tree, speakers turn on blaring sounds from a dragster revving their engine waiting for the green light and giving instructions to keep your arms down, head back, and to hold on. The Christmas Tree flashes three yellow lights and then the green and your off. The train ascends straight up the 420 foot tall hill just after the pneumatic catapult releases the train. Once up top, you can see for miles but only briefly as you then return to the ground but not before going through a 720 degree twist. Once you’re at the bottom, a long row of magnetic braking fins bring your train to a smooth stop. Here are some night shots including some timed photos of the trains being launched. Here’s a off ride video I took of the ride. Next up is one for the kids. This is your basic family friendly Roller Skater model coaster from Vekoma. 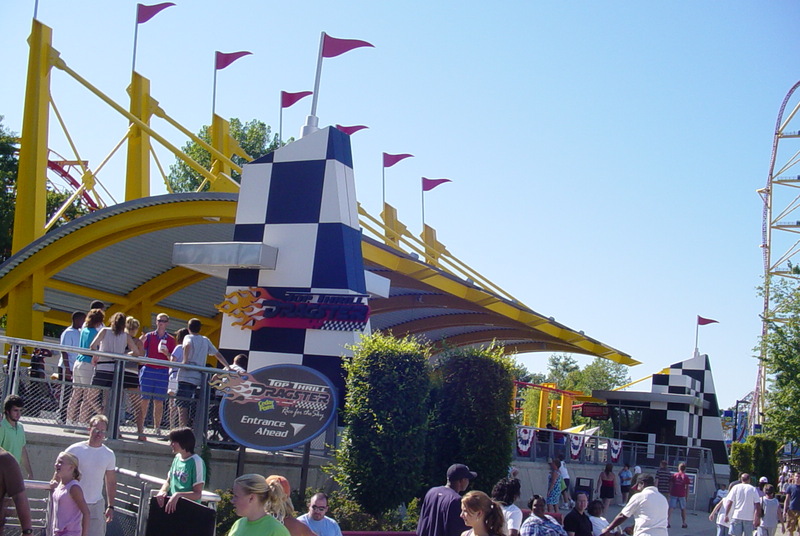 It is located in the Camp Snoopy kids section of the park and is themed to the Woodstock character of the Peanut’s Gang comic strip. 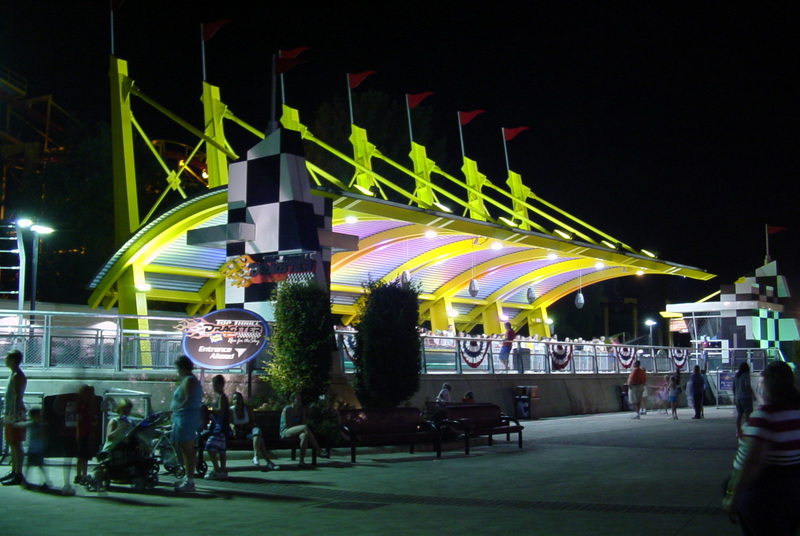 It opened here on May 10, 1999 and is approximately 1,099 feet long, almost 43 feet tall, has a top speed of about 28 mph, and a ride time of approximately one minute and six seconds. 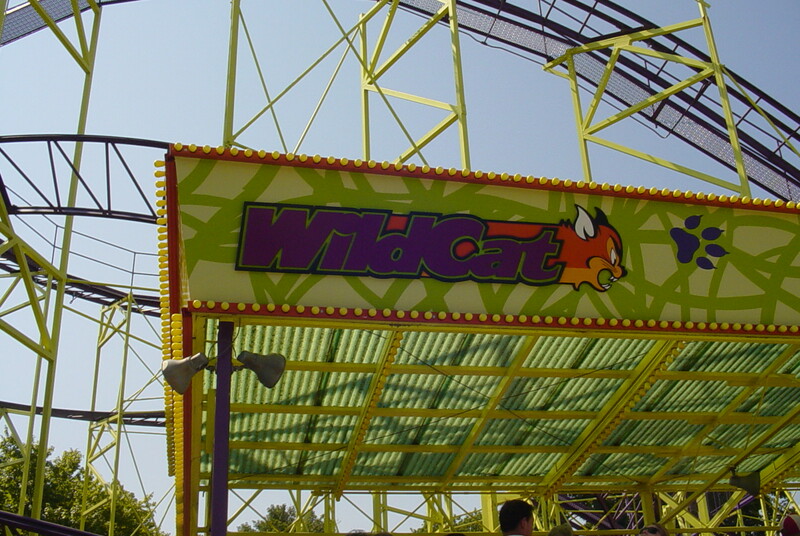 Next we’ll walk down to our next coaster which was another record breaker as well when it opened but this one Set the amusement industry on fire. 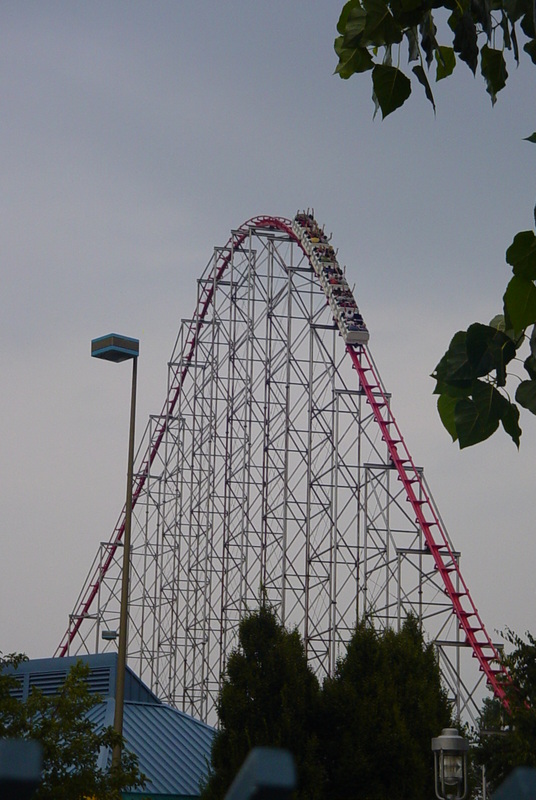 Magnum XL200 is the worlds first Hyper coaster. 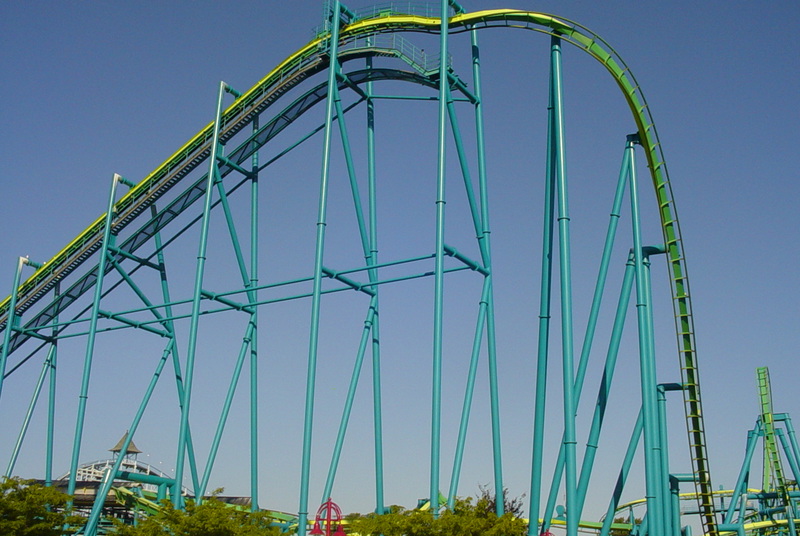 A Hyper coaster is any roller coaster with a hill or drop between 200-299 feet in height. 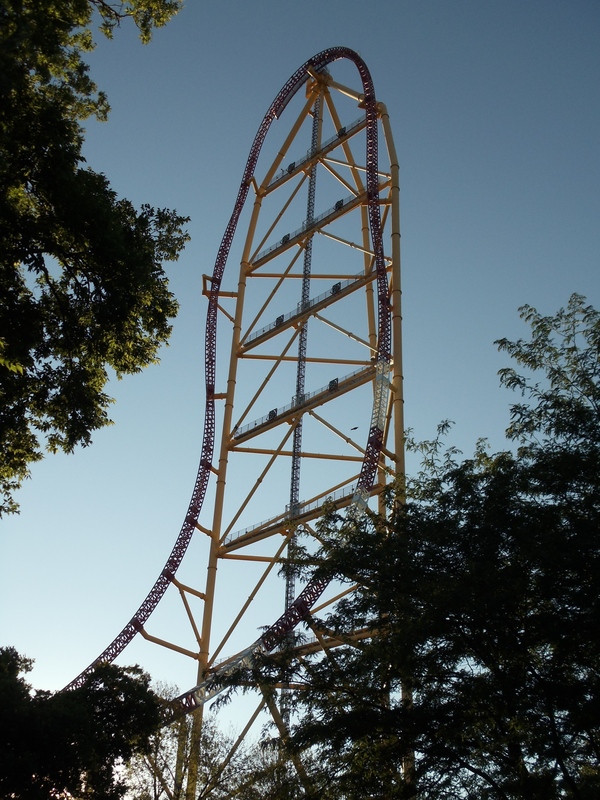 This one was the worlds tallest, at 205 feet, and fastest, at 72 mph, when it opened on May 6, 1989. 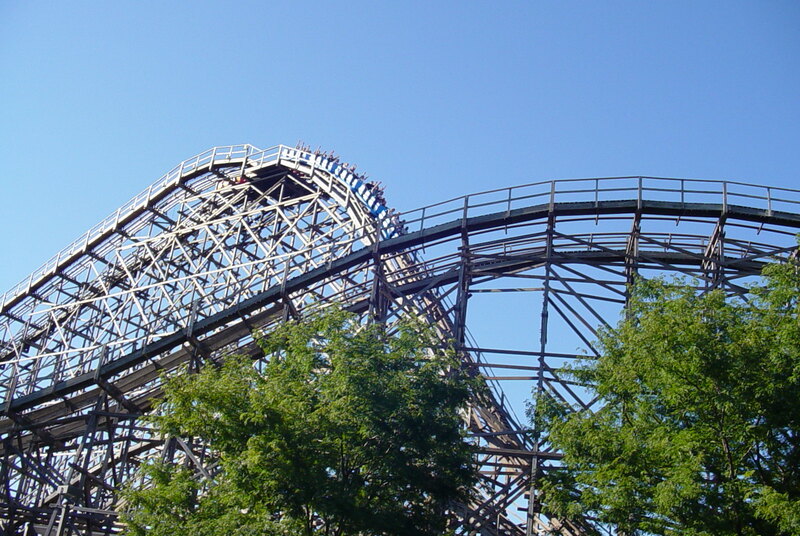 This coaster was built at a time when parks were building roller coasters with multiple inversions and it was thought at the time by most major park chains that people wanted to ride roller coasters with inversions and they wouldn’t necessarily ride a coaster that was basically a steel version of a wooden roller coaster. 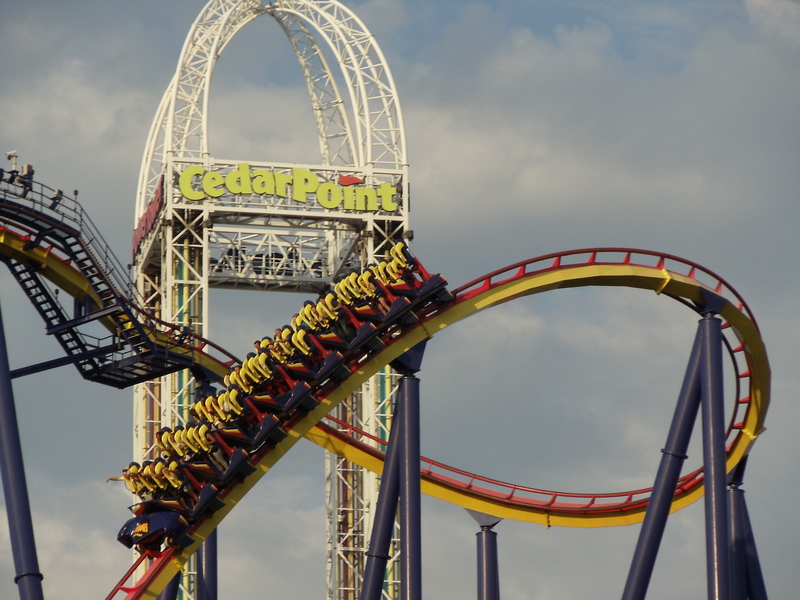 Cedar Point took the chance and built this coaster and put themselves on the map in the process. 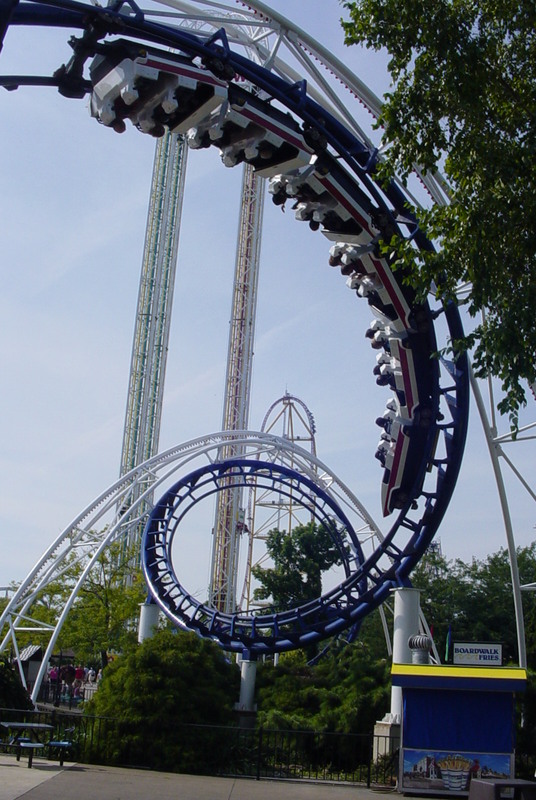 In one swoop, Cedar Point went from being a regional park to a destination park with the opening of this coaster. 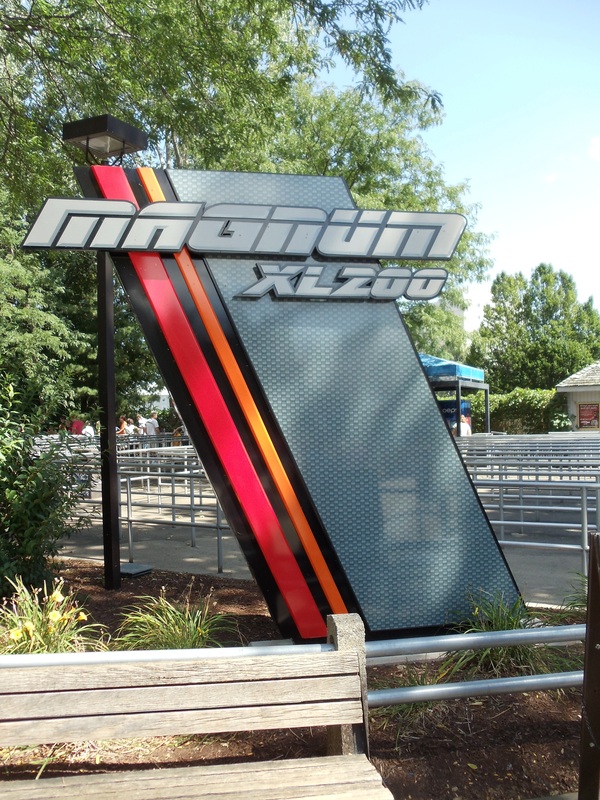 This ride proved all the experts wrong as it was an instant hit and it is still remains a very popular coaster. 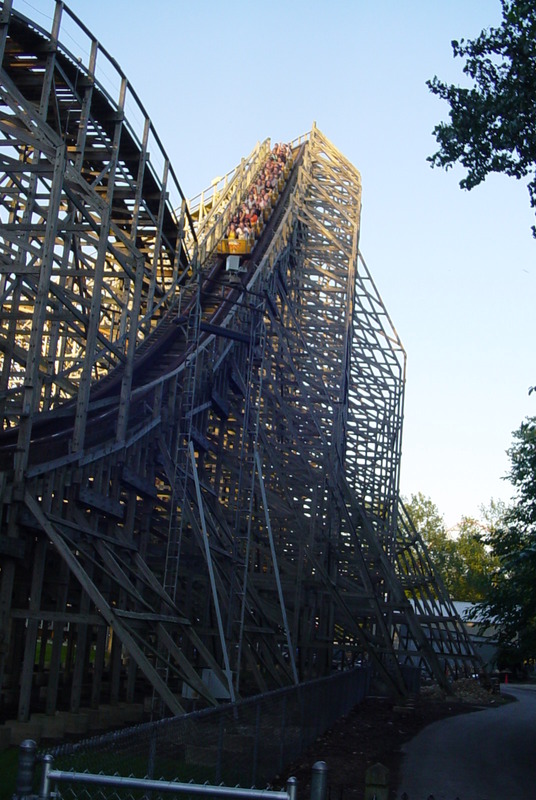 ACE (American Coaster Enthusiasts) gave this ride a “Landmark” status for its innovative design in simulating a traditional out-n-back wooden roller coaster. 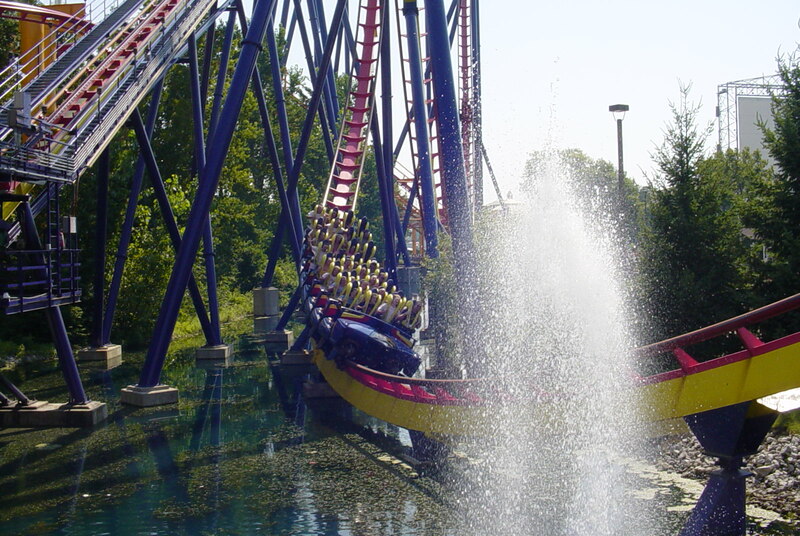 It also recognizes this coaster for being one of the first large-scale steel roller coasters to not feature inversions and that this coaster was the inspiration for many other roller coasters around the world. 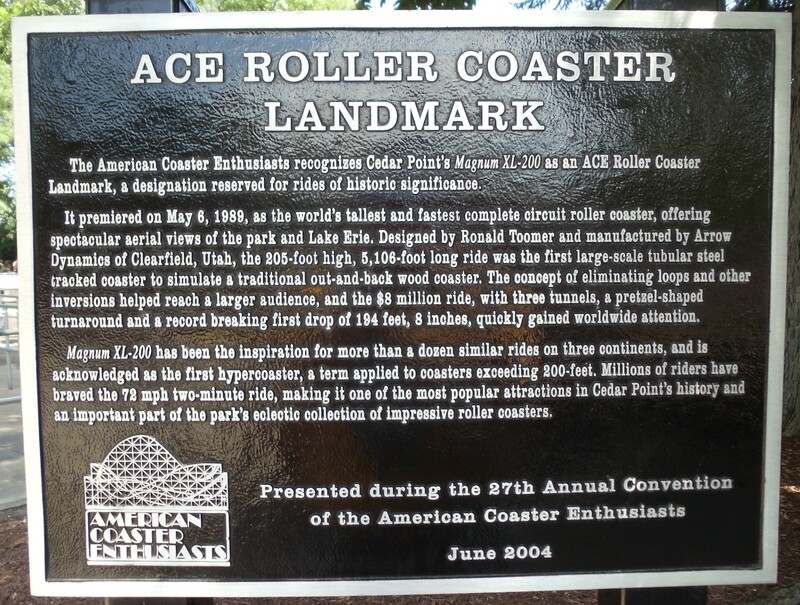 The plaque pictured below was awarded in June of 2004 and is located at the entrance to the ride. This coaster does have quite a bit of air time no matter where you sit. 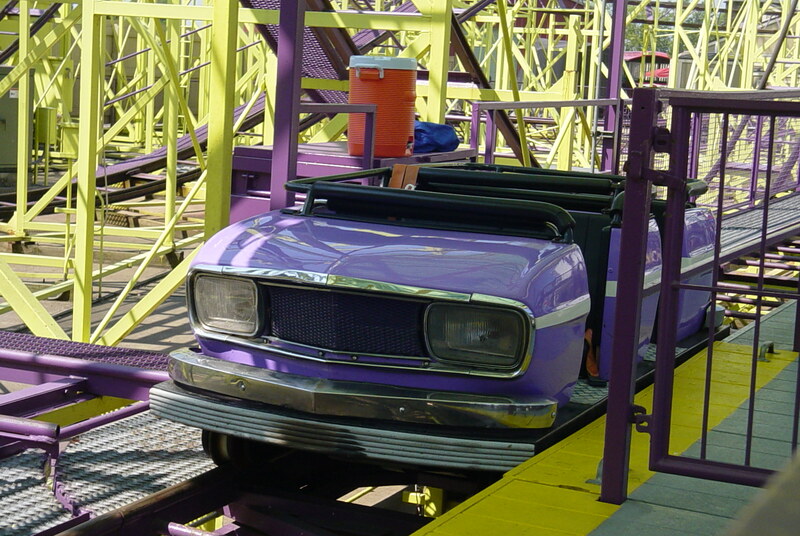 This coaster was built by Arrow Dynamics and designed by the famous Ron Toomer. 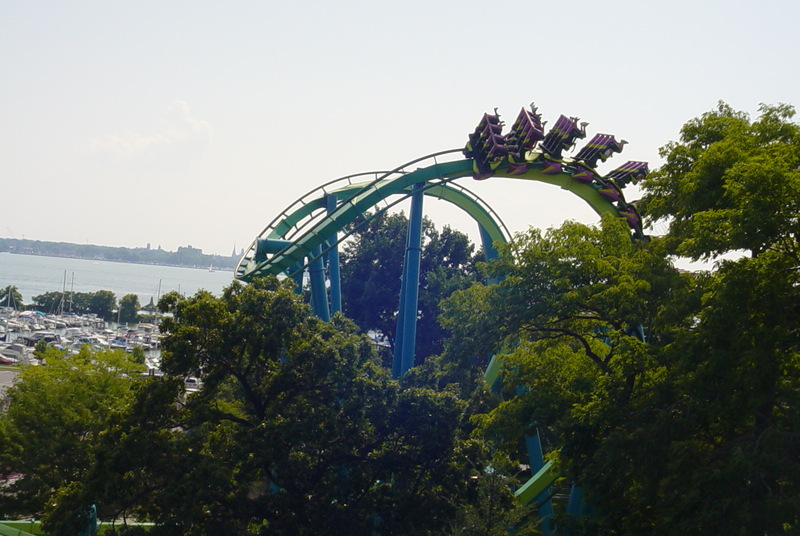 It is 5,106 feet long, has a top speed of 72 mph, is 205 feet high, with a ride time of approximately two minutes. 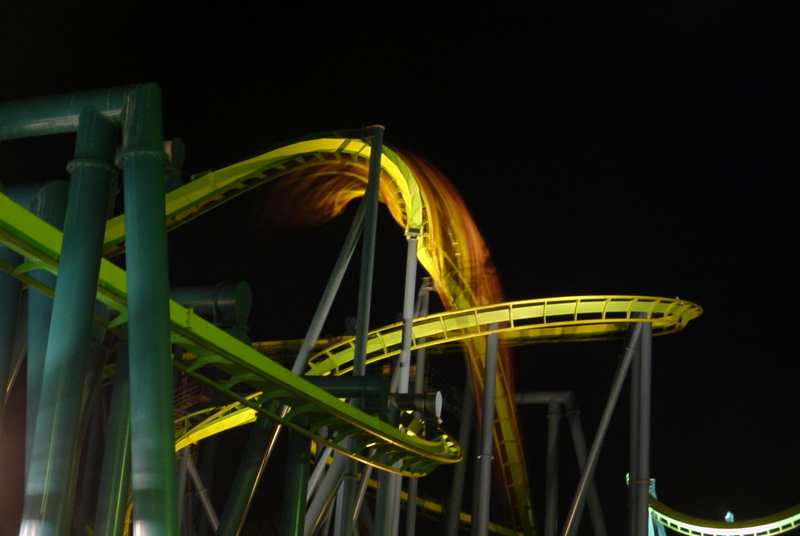 The coaster cost approximately $8,000,000 to build and has been thrilling guests ever since it opened. Next up is yet another record breaker. 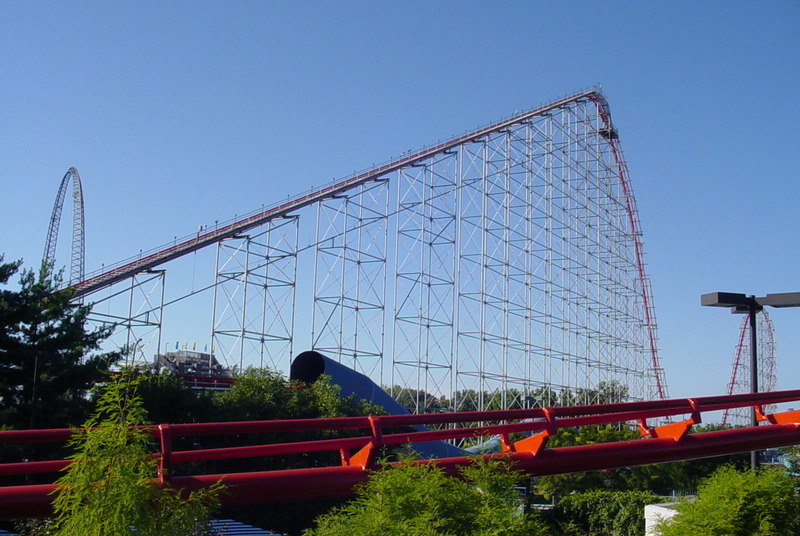 This coaster was the worlds tallest, at approximately 125 feet, and fastest, at approximately 60 mph when it opened in June of 1978, it was also built by Arrow Dynamics and designed by the famous Ron Toomer. 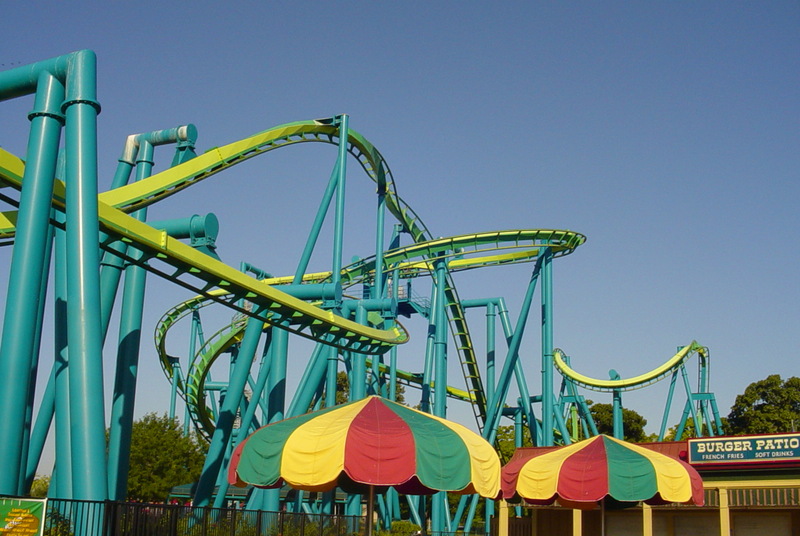 This is a steel racing roller coaster where the two trains race side by side thought the entire track. 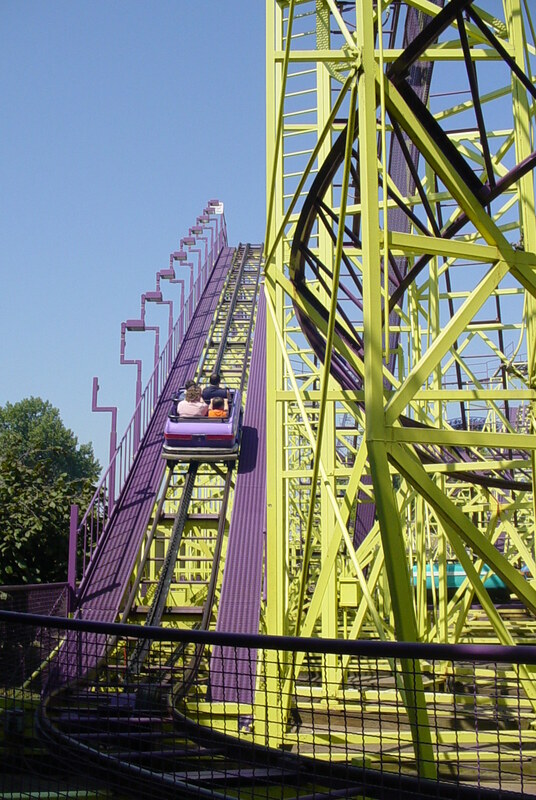 The reason I say this is a steel roller coaster is that the track is tubular steel track and the manufacturer, Arrow Dynamics, only produced steel roller coasters. This coaster is actually quite fun and you can actually reach over and barely slap hands with the other train, but only in the turns and only if the riders are about six feet or taller. Unfortunately, I don’t have any photos or off ride videos of this coaster and I couldn’t ride this one as all adults must be accompanied by a child and it is enforced. This ride was built by Intamin and opened in 1979 with a total length of 443 feet, a height of 19 feet, and a top speed of 6 mph. After that is another family friendly coaster. 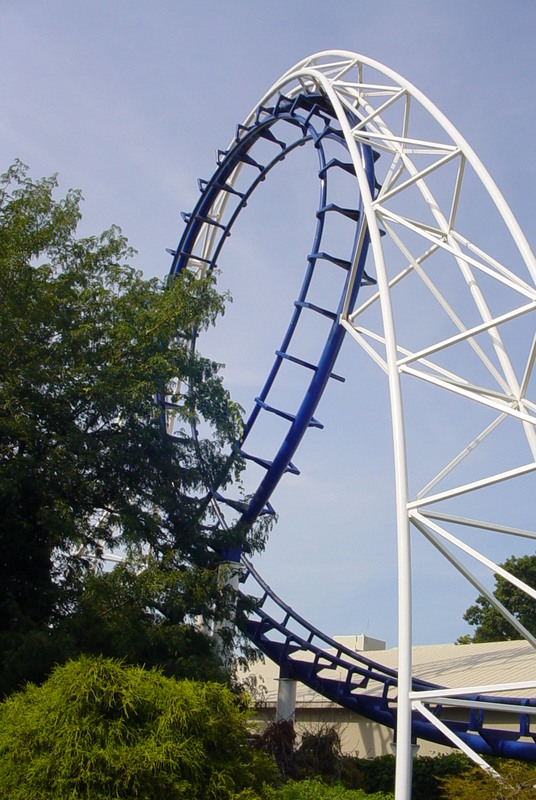 This coaster was meant to be the evil son of Blue Streak, unfortunately when you break records, things have a way of striking back. 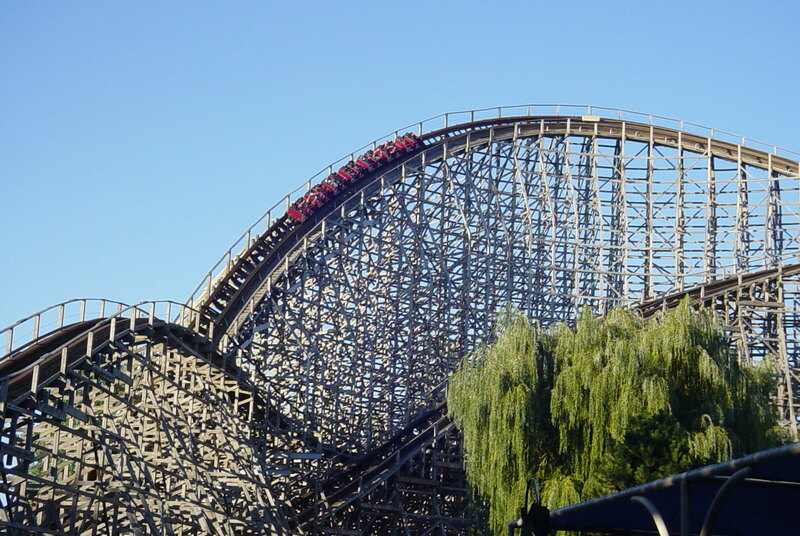 This coaster was the tallest and fastest wooden coaster in the world when it opened on May 11, 1991, unfortunately stresses of the trains going through the first turns after the first drop were so severe that those two turns had to be rebuilt and a rather significant and very noticeable trim brake had to be installed near the top of the first drop to keep the stress loads down. 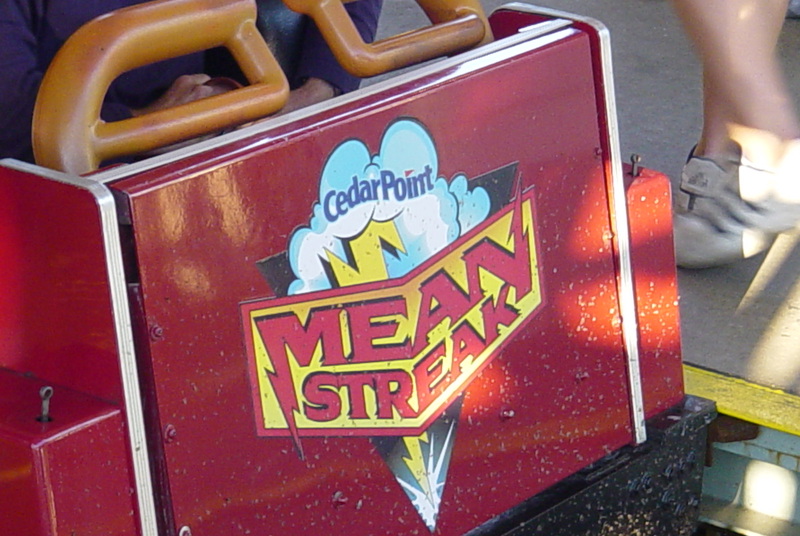 Don’t get me wrong, Mean Streak is still a good coaster to ride but it seems to me that the ride would have been so much better had it been done right before the ride was built. This coaster was built by the Dinn Corporation and is 5,427 feet long and has a ride time of about three minutes and thirteen seconds. 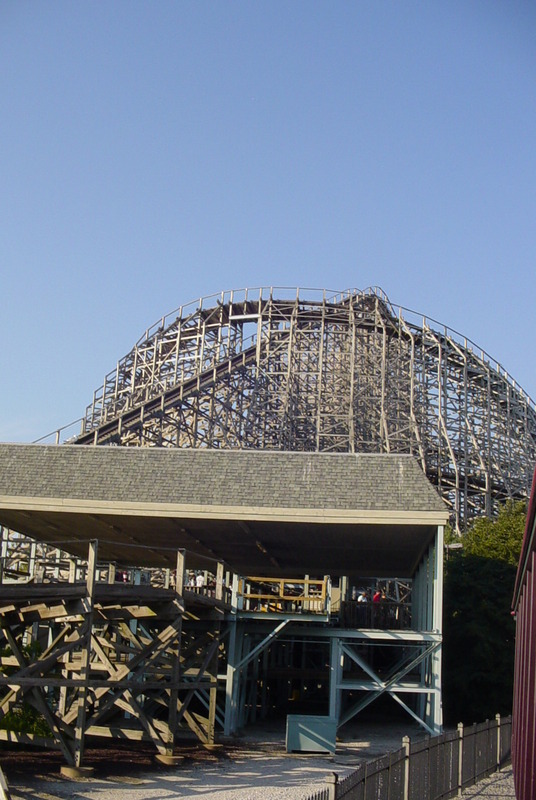 When this coaster opened, it set two records for being the tallest, at 161 feet, and the fastest, at 65 mph, wooden roller coaster in the world. Here’s an off ride video I took. Next up is a launched coaster. 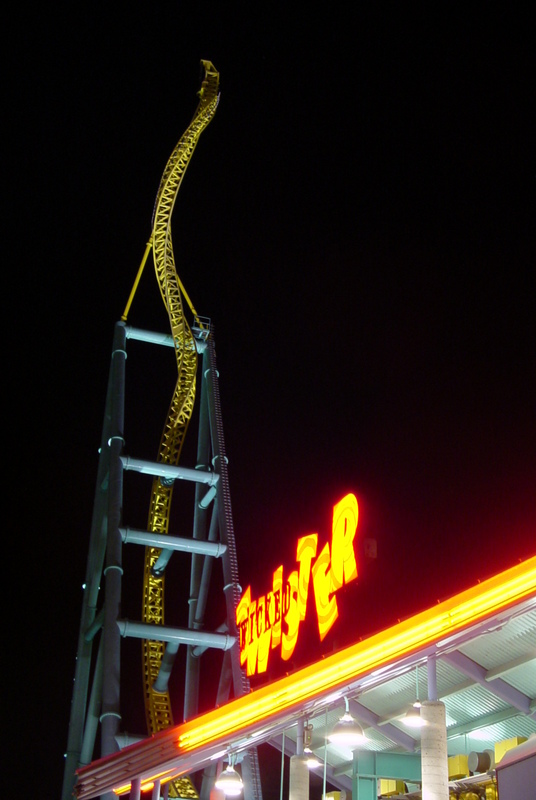 This was a record breaker as well as it had the worlds steepest drop at a 95 degree angle. 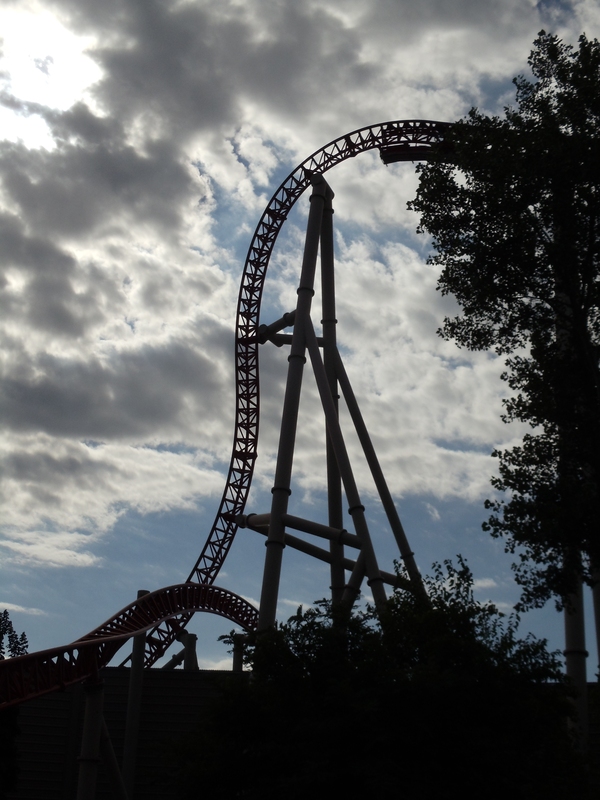 This coaster was built by Intamin AG and is actually a pretty intense yet fun coaster to ride. 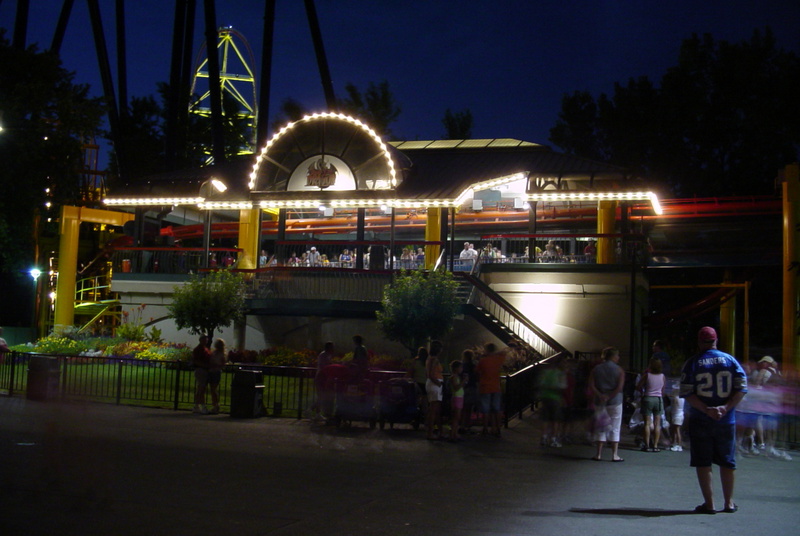 There are two launches on this ride, the first one is a magnetic launch lift hill which takes you up to the top of the lift hill at about 15-20 mph and the second one under the station, launches riders from 0-70 mph in a 700 foot long tunnel with lights and sound effects. 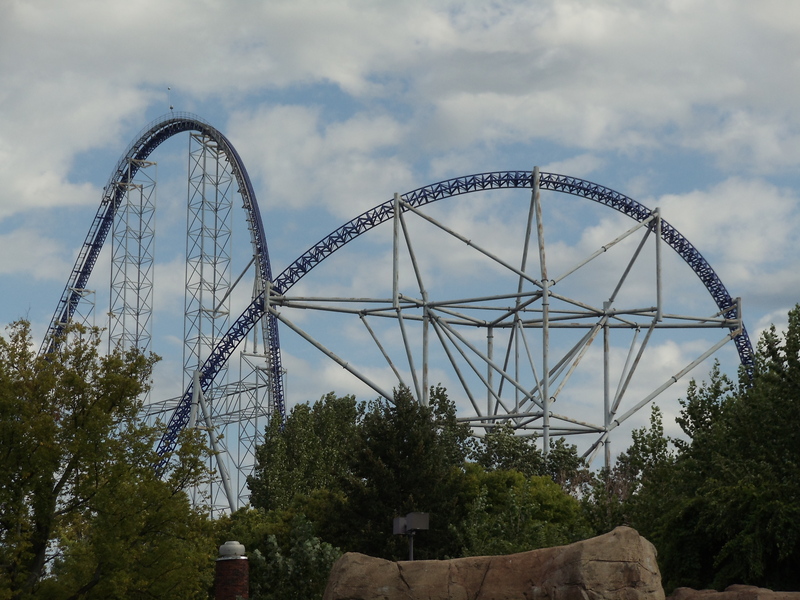 This coaster has 4,450 feet of track, is 105 feet tall, has a top speed of 70 mph, has two inversions, and a ride time of about two minutes and thirty seconds. Normally, I would say put you hands in the air, but this coaster is pretty intense. It is smooth but it does have a lot of quick turns and the over-the-shoulder restraints (OTSRs) are a bit unforgiving on the shoulders so keep your hands down and you’ll be ok. 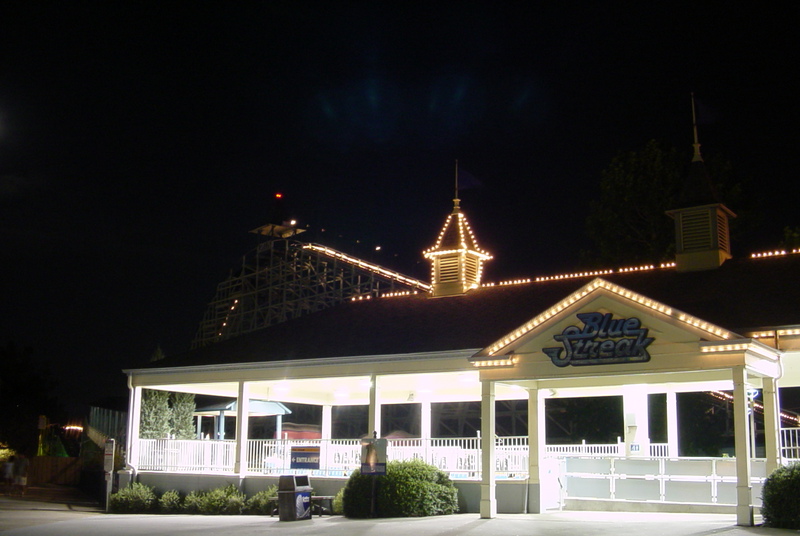 This ride opened on May 26, 2007 and it took the place of the White Water Landing log flume ride that operated here from 1982 to 2005 and was built by Arrow Development (later known as Arrow Dynamics). White Water Landing took the place of the original Shoot the Rapids log flume ride that operated here from 1967 to 1981, it was built by Cedar Point and Arrow Dynamics. 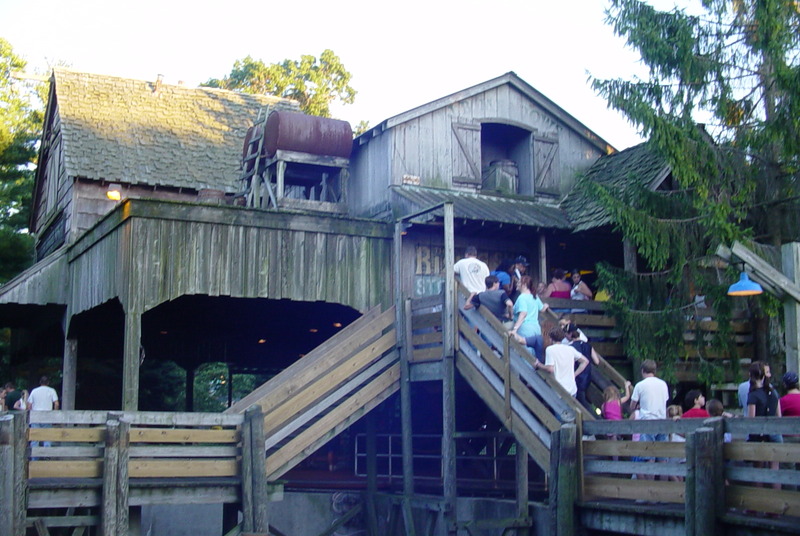 The original White Water Landing station and queue (line) houses are still standing and presently being used as the queue house and gift shop for Maverick. I do believe the photo below is of the White Water Landing station when the ride was still there but I’m not 100% positive. 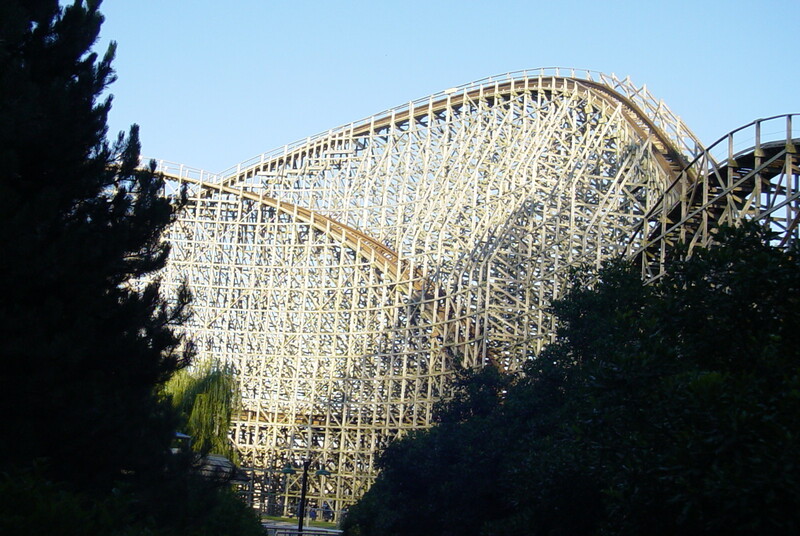 Next up is another record breaker and a coaster that is world-famous. 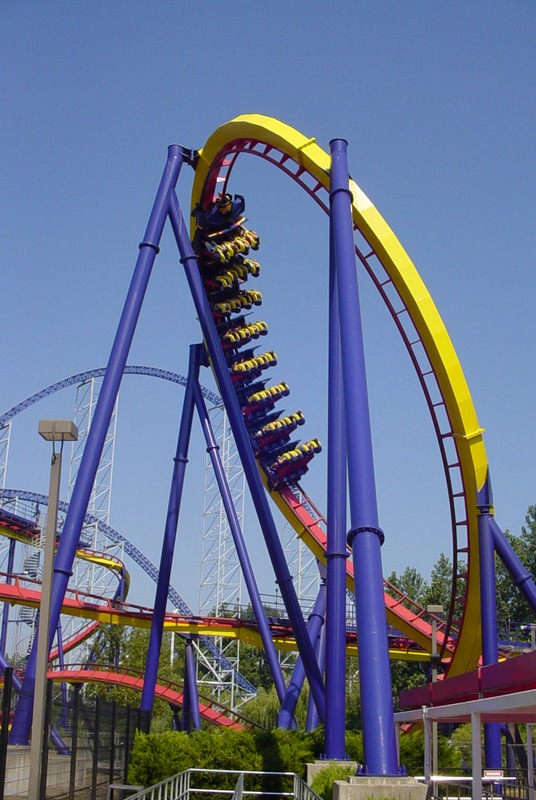 This coaster is synonymous with Cedar Point, ask any coaster enthusiast that has been to Cedar Point what their favorite coasters are and this one is likely to be at or near the top of their list. 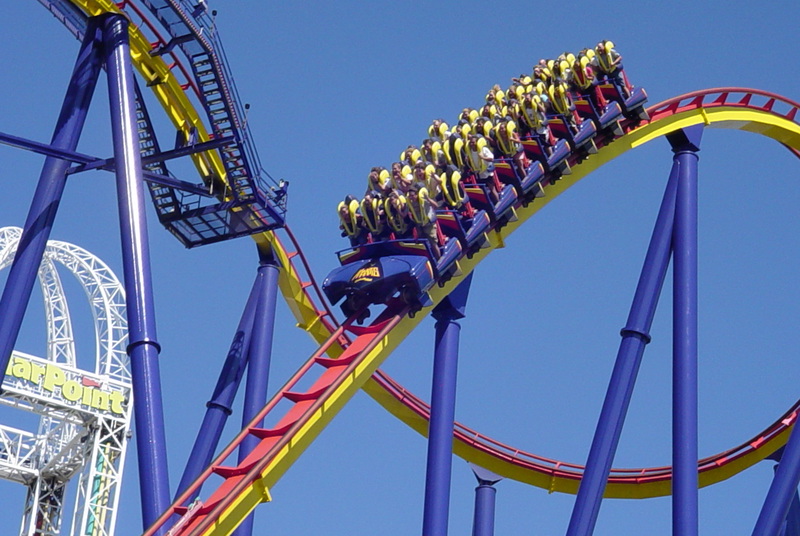 This coaster broke three records when it opened on May 13, 2000. 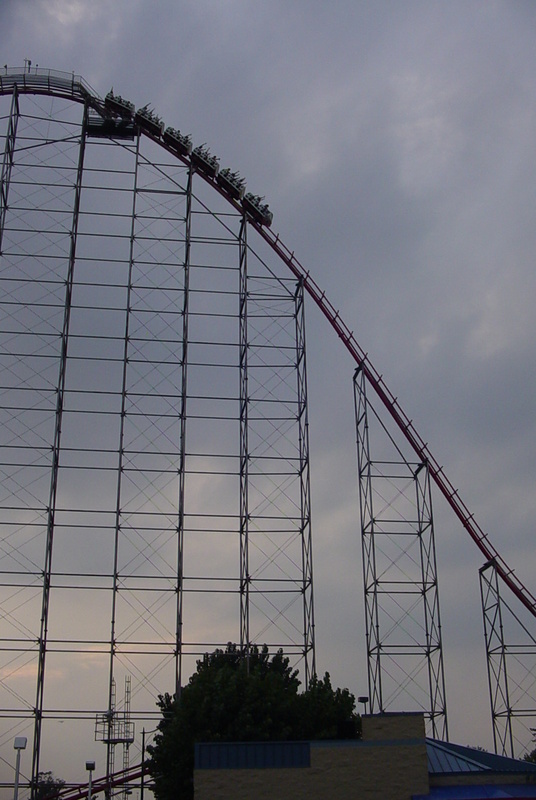 It broke the height record becoming the worlds first Gigacoaster at 310 feet tall, it also broke the top speed record at 92 mph, and maximum drop angle at 80 degrees. 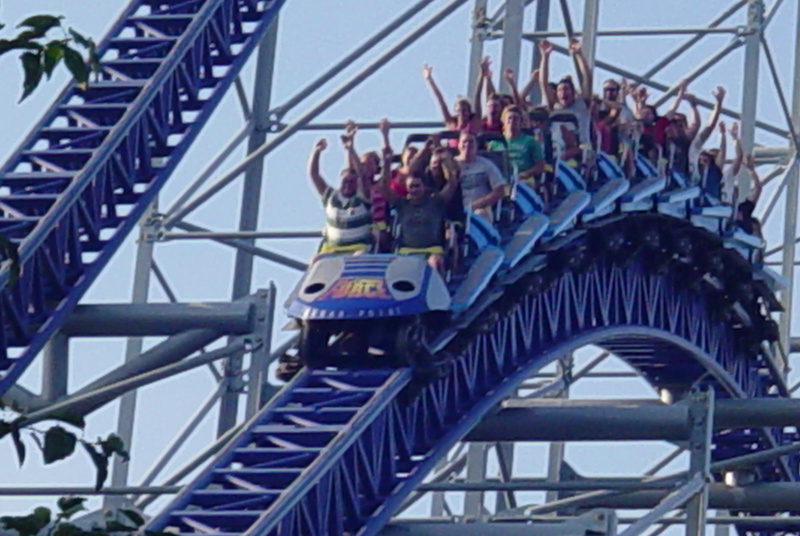 A Gigacoaster refers to any roller coaster with a drop or hill between 300 and 399 feet in height. 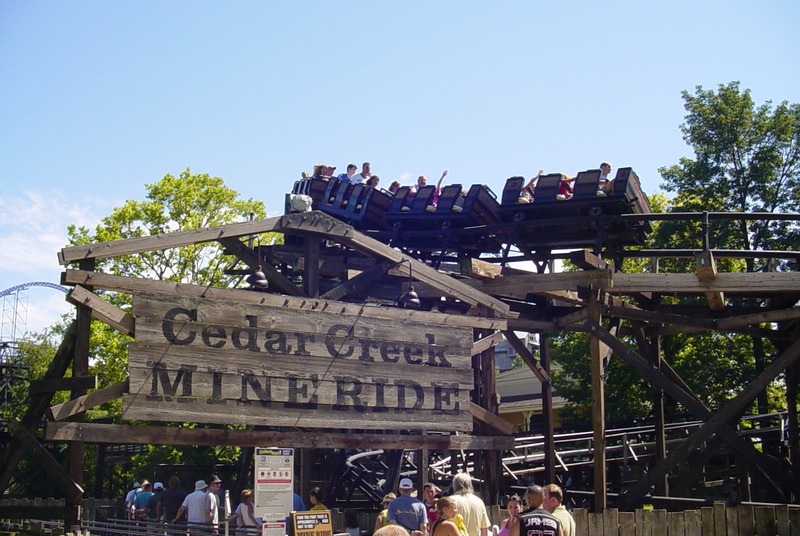 This coaster was also the first coaster to incorporate a cable lift system to pull the trains up to the top of the lift hill. You can see part of the lift system in the photo below. This coaster is absolutely smooth and it doesn’t throw you around at all. 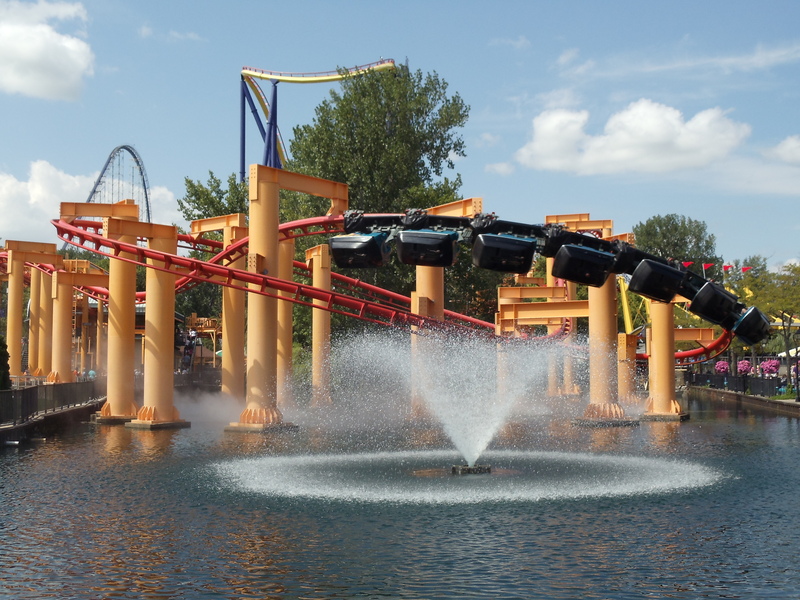 There’s also a copious amount of “air time” as well no matter where you sit on this coaster which is one of the main reasons why this coaster is so highly rated by my fellow coaster enthusiasts. It has been given the Golden Ticket award from Amusement Today for being rated the number one roller coaster several times and, to my knowledge, it has never been ranked any lower than second or third best in the world since it opened in 2000. 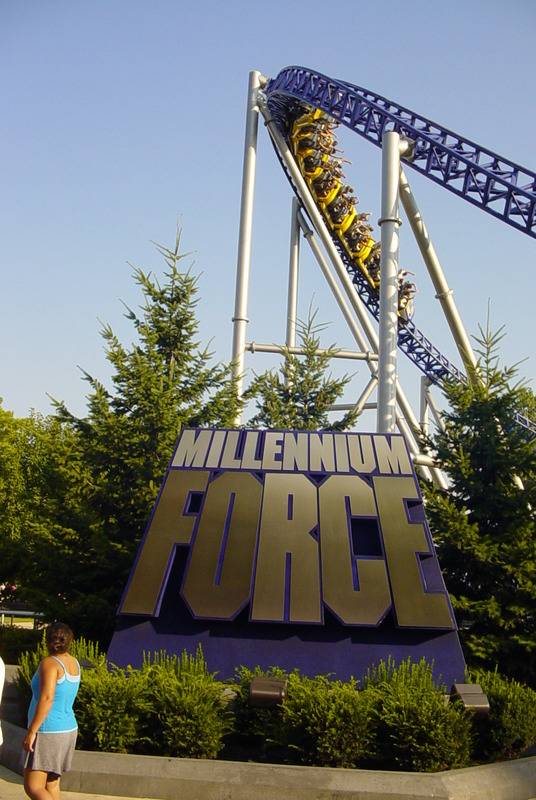 Millennium Force is 310 feet tall, is 6,595 feet long, has a top speed of 93 mph, a maximum vertical angle of 80 degrees, and a total ride time of two minutes and twenty seconds. You can see in the above picture that people really enjoy this coaster. 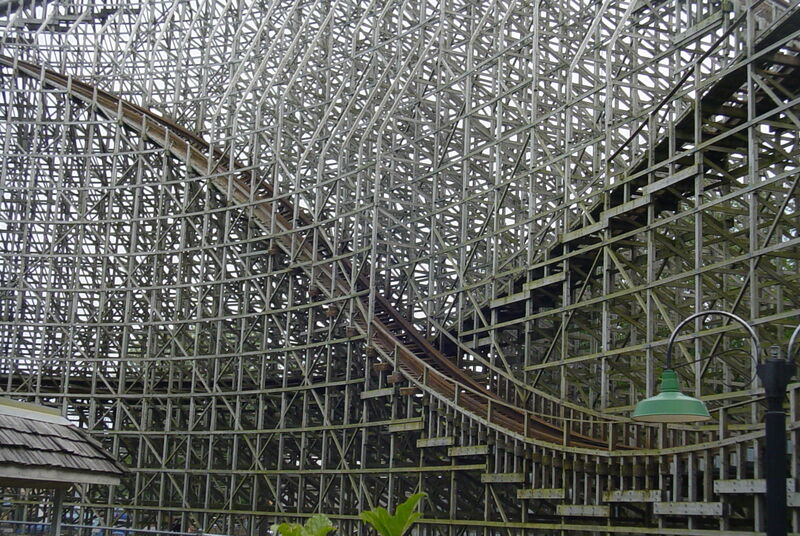 It’s Common of for this coaster to have lines as long as two hours on an average day. Next up is a coaster you’ll have to stand up to. 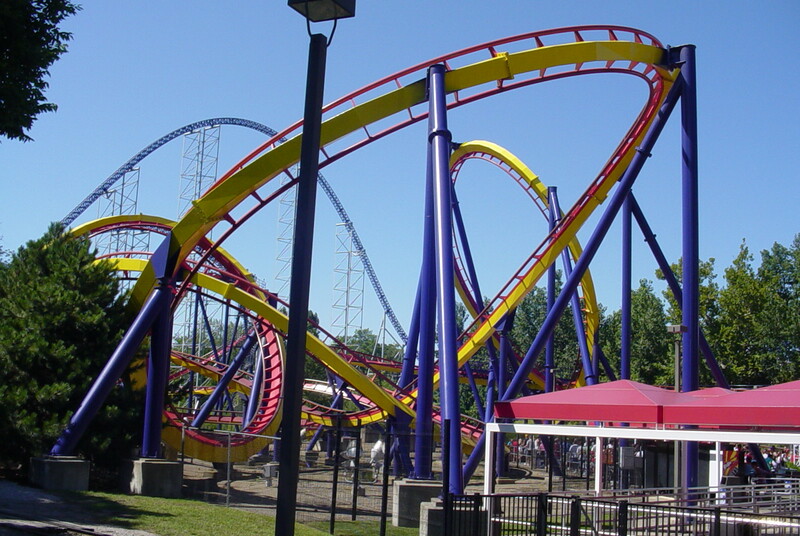 This coaster was originally going to be named Banshee until the locals caught wind of it and objected vociferously until the name was changed. They even had the signs already made for the coaster, those signs are now being used on the Steel Force coaster at Dorney Park, their sister park in Allentown, PA.
Mantis is a stand up coaster from B&M, that’s right, you stand up on this coaster. 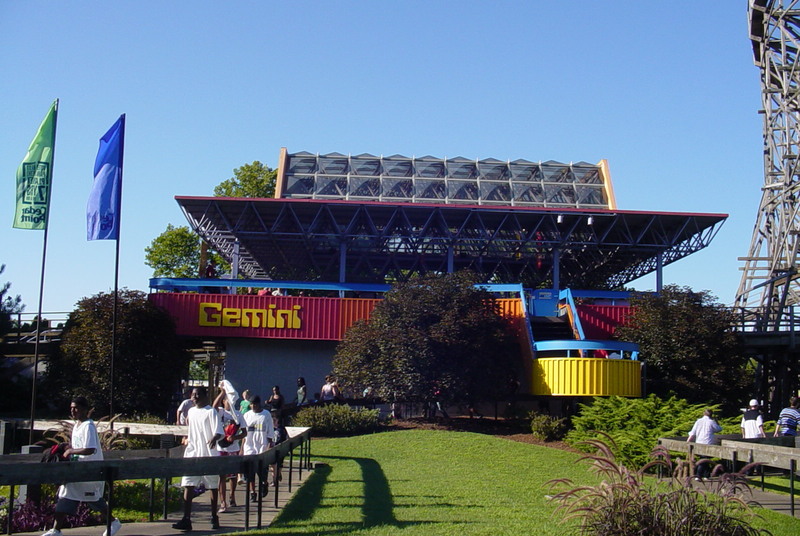 It opened on May 11, 1996 to rave reviews from coaster enthusiasts. Stand up coasters tend to be intense so I wouldn’t recommend this for a novice or a first time rider. 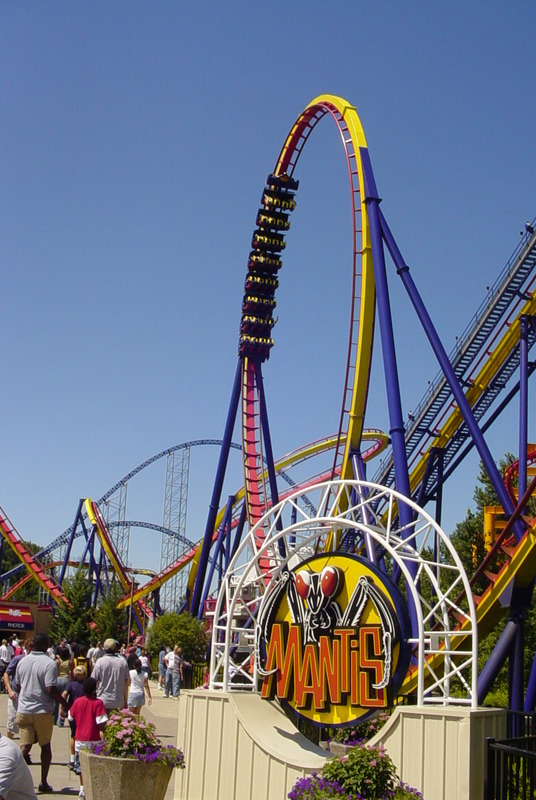 Mantis is 3,900 feet long, is 145 feet high, has four inversions, a top speed of 60 mph, and a ride time of two minutes and forty seconds. Here’s an off ride video I shot. 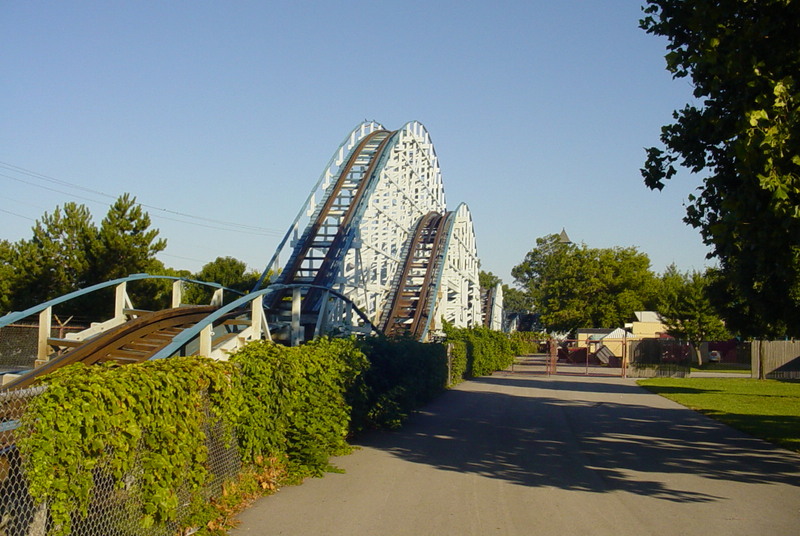 Next is a coaster that is no longer there. This was a transportable coaster from Anton Schwarzkopf, a notable pioneer in the amusement industry. 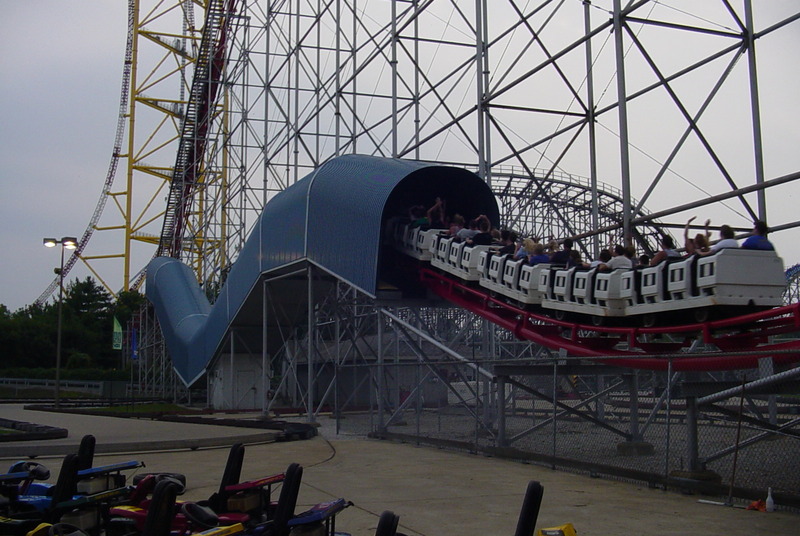 It operated at Cedar Point from 1979 to 2011. 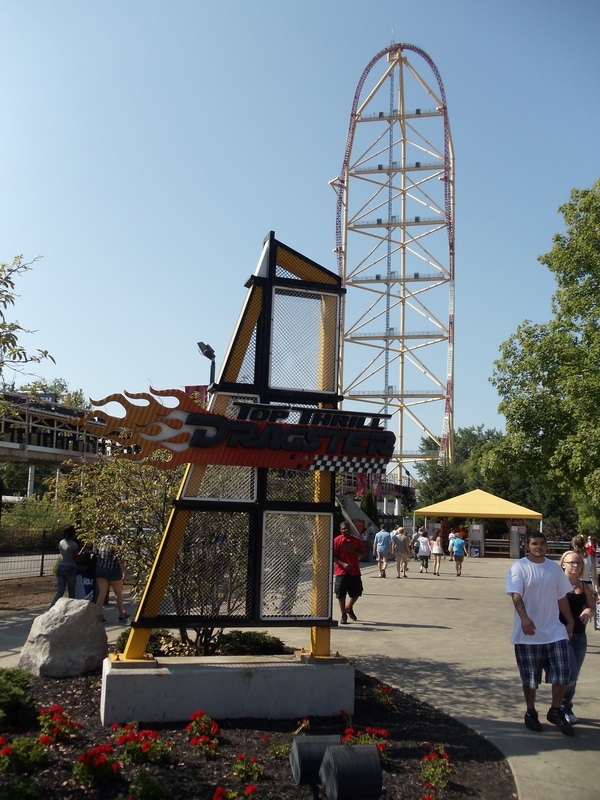 The track was 1,837 feet long, had a height of about 50 feet, a top speed of 40 mph, and a ride time of about a minute and twenty-five seconds. It was a fun ride and not too rough as transportable coasters on the fair circuit tend to be. 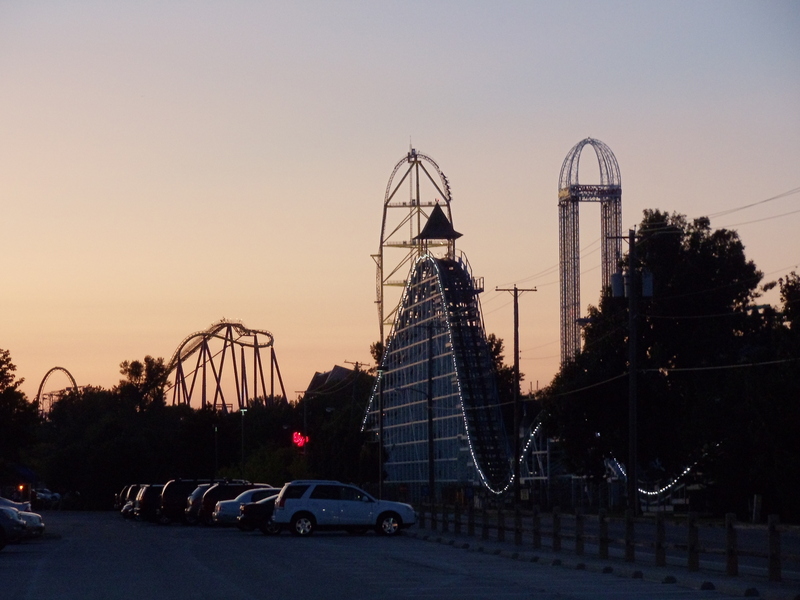 Cedar Point did a great job keeping it up until it was removed. 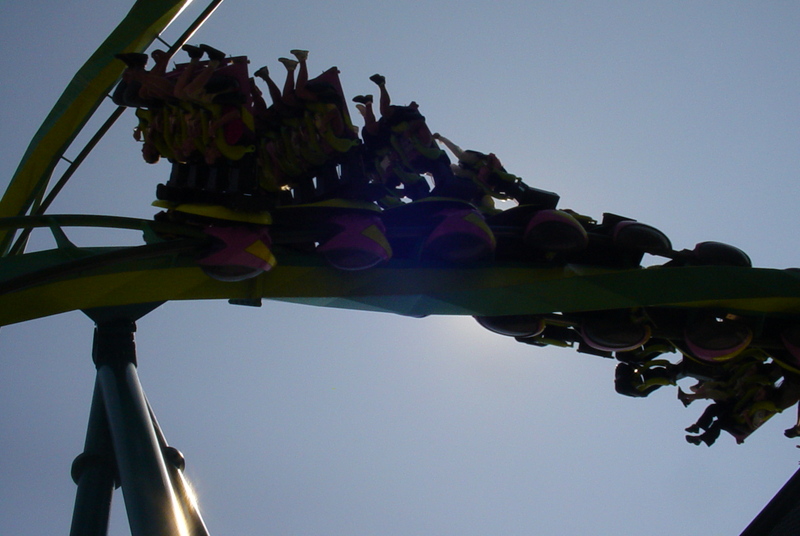 This is a suspended coaster from Arrow Dynamics. 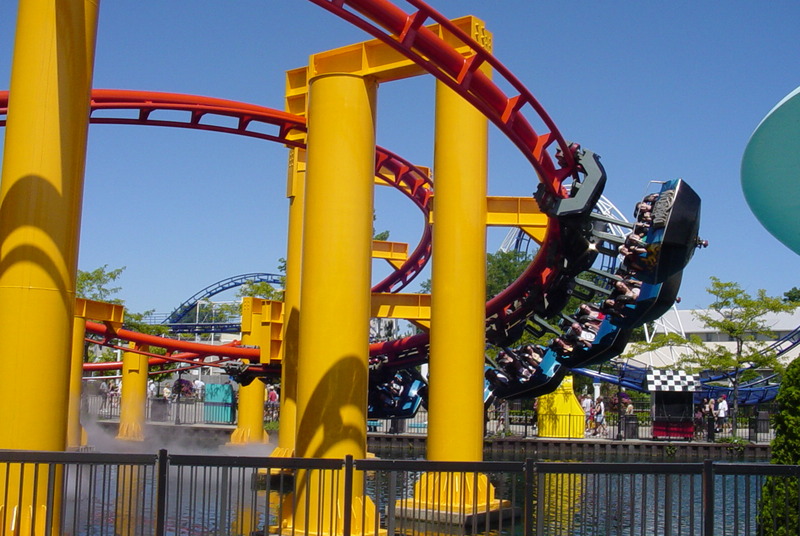 There is a difference between suspended and inverted coasters. Please look at the photos below and then read the Raptor review near the top of this page. 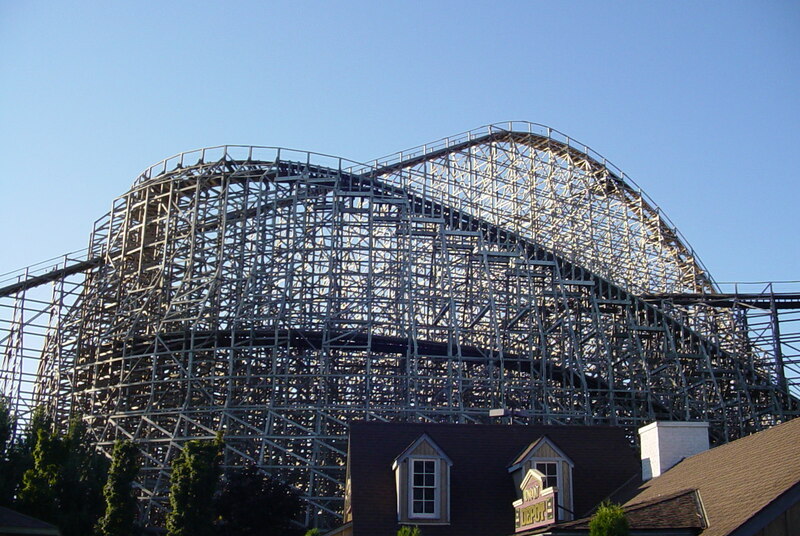 It is 2,800 feet long, 76 feet high, has a top speed of about 40 mph, has two lift hills, and a ride time of about two minutes and forty seconds. This coaster is very family friendly and is still quite popular with the public. I’ve seen entire families ride together on this one including grandparents. 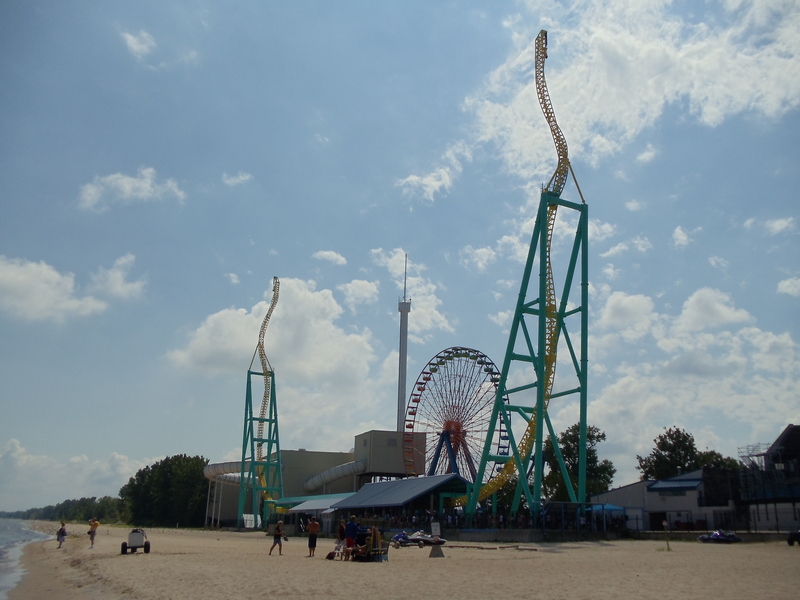 I hope you enjoyed reading this rather lengthy review of my visits to Cedar Point and I hope I was helpful in answering most, if not all of your questions. Please feel free to leave a comment or a question below and take part in the poll as well. know such exact about my trouble. You are incredible! Thanks for the nice comment and I’m glad you enjoyed it. 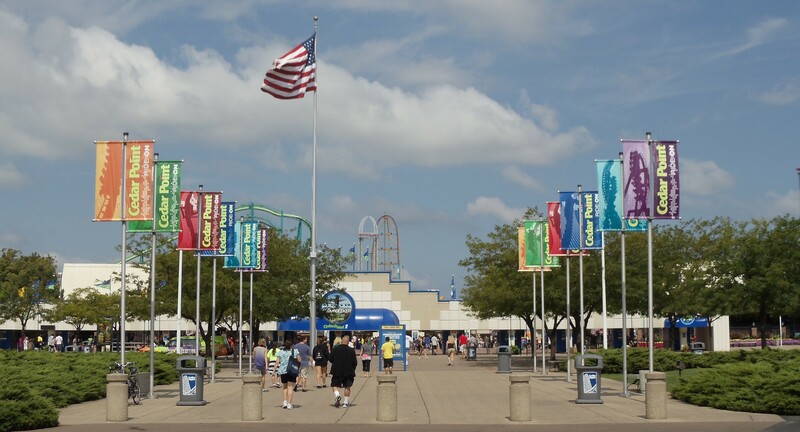 Were you planning on a visit to Cedar Point? If so did you find this helpful or informative?